2 emissions compared to five of IPCC's emissions scenarios. The dips are related to global recessions. Data from IPCC SRES scenarios; Data spreadsheet included with International Energy Agency's "CO2 Emissions from Fuel Combustion 2010 – Highlights"; and Supplemental IEA data. Image source: Skeptical Science. 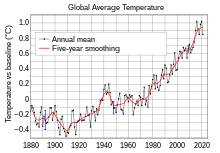 Global mean surface temperature change from 1880 to 2016, relative to the 1951–1980 mean. The black line is the global annual mean and the red line is the five-year lowess smooth. The blue uncertainty bars show a 95% confidence limit. Source: NASA GISS. Global dimming, from sulfate aerosol air pollution, between 1950 and 1980 is believed to have mitigated global warming somewhat. Global carbon dioxide emissions from human activities 1800–2007. Greenhouse gas emissions by sector. See World Resources Institute for a detailed breakdown. The 2000s survey of direct Life-cycle greenhouse-gas emissions of energy sources, the indirect or downwind global warming potential impacts of each energy source, in terms of Carbon dioxide equivalent figures, remain under continued investigation. Climate change mitigation consists of actions to limit the magnitude or rate of long-term global warming and its related effects. Climate change mitigation generally involves reductions in human (anthropogenic) emissions of greenhouse gases (GHGs). Mitigation may also be achieved by increasing the capacity of carbon sinks, e.g., through reforestation. Mitigation policies can substantially reduce the risks associated with human-induced global warming. According to the IPCC's 2014 assessment report, "Mitigation is a public good; climate change is a case of the 'tragedy of the commons'. Effective climate change mitigation will not be achieved if each agent (individual, institution or country) acts independently in its own selfish interest (see International cooperation and Emissions trading), suggesting the need for collective action. Some adaptation actions, on the other hand, have characteristics of a private good as benefits of actions may accrue more directly to the individuals, regions, or countries that undertake them, at least in the short term. Nevertheless, financing such adaptive activities remains an issue, particularly for poor individuals and countries." Examples of mitigation include reducing energy demand by increasing energy efficiency, phasing out fossil fuels by switching to low-carbon energy sources, and removing carbon dioxide from Earth's atmosphere. for example, through improved building insulation. Another approach to climate change mitigation is climate engineering. Most countries are parties to the United Nations Framework Convention on Climate Change (UNFCCC). The ultimate objective of the UNFCCC is to stabilize atmospheric concentrations of GHGs at a level that would prevent dangerous human interference of the climate system. Scientific analysis can provide information on the impacts of climate change, but deciding which impacts are dangerous requires value judgments. In 2010, Parties to the UNFCCC agreed that future global warming should be limited to below 2.0 °C (3.6 °F) relative to the pre-industrial level. With the Paris Agreement of 2015 this was confirmed, but was revised with a new target laying down "parties will do the best" to achieve warming below 1.5 °C. The current trajectory of global greenhouse gas emissions does not appear to be consistent with limiting global warming to below 1.5 or 2 °C. Other mitigation policies have been proposed, some of which are more stringent or modest than the 2 °C limit. In 2019, after 2 years of research, scientists from Australia, and Germany presented the "One Earth Climate Model" that shows how exactly we can stay below 1.5 degrees in price of 1.7 trillion dollars per year. Stabilizing CO2 emissions at their present level would not stabilize its concentration in the atmosphere. Stabilizing the atmospheric concentration of CO2 at a constant level would require emissions to be effectively eliminated. One of the issues often discussed in relation to climate change mitigation is the stabilization of greenhouse gas concentrations in the atmosphere. The United Nations Framework Convention on Climate Change (UNFCCC) has the ultimate objective of preventing "dangerous" anthropogenic (i.e., human) interference of the climate system. As is stated in Article 2 of the Convention, this requires that greenhouse gas (GHG) concentrations are stabilized in the atmosphere at a level where ecosystems can adapt naturally to climate change, food production is not threatened, and economic development can proceed in a sustainable fashion. 2 is the most important of the anthropogenic greenhouse gases (see radiative forcing). 2. Stabilizing emissions of CO2 at current levels would not lead to a stabilization in the atmospheric concentration of CO2. In fact, stabilizing emissions at current levels would result in the atmospheric concentration of CO2 continuing to rise over the 21st century and beyond (see the graphs opposite). The reason for this is that human activities are adding CO2 to the atmosphere faster than natural processes can remove it (see carbon dioxide in Earth's atmosphere for a complete explanation). This is analogous to a flow of water into a bathtub. So long as the tap runs water (analogous to the emission of carbon dioxide) into the tub faster than water escapes through the plughole (analogous to the natural removal of carbon dioxide from the atmosphere) the level of water in the tub (analogous to the concentration of carbon dioxide in the atmosphere) will continue to rise. 2 concentrations for around a century, but even greater reductions would be required beyond this. Other research has found that, after leaving room for emissions for food production for 9 billion people and to keep the global temperature rise below 2 °C, emissions from energy production and transport will have to peak almost immediately in the developed world and decline at ca. 10% per annum until zero emissions are reached around 2030. In developing countries energy and transport emissions would have to peak by 2025 and then decline similarly. Stabilizing the atmospheric concentration of the other greenhouse gasses humans emit also depends on how fast their emissions are added to the atmosphere, and how fast the GHGs are removed. Stabilization for these gases is described in the later section on non-CO2 GHGs. In 2018 an international team of scientist published research saying that the current mitigation policy in Paris Agreement is insufficient to limit the temperature rise to 2 degrees. They say that even if all the current pledges will be accomplished there is a chance for a 4.5 degree temperature rise in decades. To preventing that, restoration of natural Carbon sinks, Carbon dioxide removal, changes in society and values will be necessary. Projections of future greenhouse gas emissions are highly uncertain. In the absence of policies to mitigate climate change, GHG emissions could rise significantly over the 21st century. Numerous assessments have considered how atmospheric GHG concentrations could be stabilized. The lower the desired stabilization level, the sooner global GHG emissions must peak and decline. GHG concentrations are unlikely to stabilize this century without major policy changes. Rate of world energy usage per day, from 1970 to 2010. Every fossil fuel source has increased in large amounts between 1970 and 2010, dominating all other energy sources. Hydroelectricity has increased at a slow steady rate over this same period, nuclear entered a period of rapid growth between 1970 and 1990 before leveling off. Other renewables, between 2000 and 2010 have, having started from a low usage rate, began to enter into a period of rapid growth. 1000 TWh=1 PWh. "Hydropower-Internalised Costs and Externalised Benefits"; Frans H. Koch; International Energy Agency (IEA)-Implementing Agreement for Hydropower Technologies and Programmes; 2000. To create lasting climate change mitigation, the replacement of high carbon emission intensity power sources, such as conventional fossil fuels—oil, coal, and natural gas—with low-carbon power sources is required. Fossil fuels supply humanity with the vast majority of our energy demands, and at a growing rate. In 2012 the IEA noted that coal accounted for half the increased energy use of the prior decade, growing faster than all renewable energy sources. Both hydroelectricity and nuclear power together provide the majority of the generated low-carbon power fraction of global total power consumption. Change and use of energy, by source, in units of (PWh) in that year. This graph shows the projected contribution of various energy sources to world primary electricity consumption (PEC). It is based on a climate change mitigation scenario, in which GHG emissions are substantially reduced over the 21st century. In the scenario, emission reductions are achieved using a portfolio of energy sources, as well as reductions in energy demand. Also available in greyscale. Assessments often suggest that GHG emissions can be reduced using a portfolio of low-carbon technologies. At the core of most proposals is the reduction of greenhouse gas (GHG) emissions through reducing energy waste and switching to low-carbon power sources of energy. As the cost of reducing GHG emissions in the electricity sector appears to be lower than in other sectors, such as in the transportation sector, the electricity sector may deliver the largest proportional carbon reductions under an economically efficient climate policy. "Economic tools can be useful in designing climate change mitigation policies." "While the limitations of economics and social welfare analysis, including cost–benefit analysis, are widely documented, economics nevertheless provides useful tools for assessing the pros and cons of taking, or not taking, action on climate change mitigation, as well as of adaptation measures, in achieving competing societal goals. Understanding these pros and cons can help in making policy decisions on climate change mitigation and can influence the actions taken by countries, institutions and individuals." 2 emissions for a battery-electric car is 180 grams per mile vs 430 grams per mile for a gasoline car. The emissions would be displaced away from street level, where they have "high human-health implications. Increased use of electricity "generation for meeting the future transportation load is primarily fossil-fuel based", mostly natural gas, followed by coal, but could also be met through nuclear, tidal, hydroelectric and other sources. A range of energy technologies may contribute to climate change mitigation. These include nuclear power and renewable energy sources such as biomass, hydroelectricity, wind power, solar power, geothermal power, ocean energy, and; the use of carbon sinks, and carbon capture and storage. For example, Pacala and Socolow of Princeton have proposed a 15 part program to reduce CO2 emissions by 1 billion metric tons per year − or 25 billion tons over the 50-year period using today's technologies as a type of global warming game. Another consideration is how future socioeconomic development proceeds. Development choices (or "pathways") can lead differences in GHG emissions. Political and social attitudes may affect how easy or difficult it is to implement effective policies to reduce emissions. These appear to differ significantly from the popular advice for “greening” one's lifestyle, which seem to fall mostly into the “low-impact” category: Replacing a typical car with a hybrid (0.52 tonnes); Washing clothes in cold water (0.25 tonnes); Recycling (0.21 tonnes); Upgrading light bulbs (0.10 tonnes); etc. The researchers found that public discourse on reducing one's carbon footprint overwhelmingly focuses on low-impact behaviors, and that mention of the high-impact behaviors is almost non-existent in the mainstream media, government publications, K-12 school textbooks, etc. 2eq) to be: 7.19 kg/day for high meat-eaters through to 3.81 kg/day for vegetarians and 2.89 kg/day for vegans. The widespread adoption of a vegetarian diet could cut food-related greenhouse gas emissions by 63% by 2050. China introduced new dietary guidelines in 2016 which aim to cut meat consumption by 50% and thereby reduce greenhouse gas emissions by 1 billion tonnes by 2030. A 2016 study concluded that taxes on meat and milk could simultaneously result in reduced greenhouse gas emissions and healthier diets. The study analyzed surcharges of 40% on beef and 20% on milk and suggests that an optimum plan would reduce emissions by 1 billion tonnes per year. A 230-volt LED light bulb, with an E27 base (10 watts, 806 lumens). Efficient energy use, sometimes simply called "energy efficiency", is the goal of efforts to reduce the amount of energy required to provide products and services. For example, insulating a home allows a building to use less heating and cooling energy to achieve and maintain a comfortable temperature. Installing LED lighting, fluorescent lighting, or natural skylight windows reduces the amount of energy required to attain the same level of illumination compared to using traditional incandescent light bulbs. Compact fluorescent lamps use only 33% of the energy and may last 6 to 10 times longer than incandescent lights. LED lamps use only about 10% of the energy an incandescent lamp requires. Energy efficiency has proved to be a cost-effective strategy for building economies without necessarily growing energy consumption. For example, the state of California began implementing energy-efficiency measures in the mid-1970s, including building code and appliance standards with strict efficiency requirements. During the following years, California's energy consumption has remained approximately flat on a per capita basis while national US consumption doubled. As part of its strategy, California implemented a "loading order" for new energy resources that puts energy efficiency first, renewable electricity supplies second, and new fossil-fired power plants last. Energy conservation is broader than energy efficiency in that it encompasses using less energy to achieve a lesser energy demanding service, for example through behavioral change, as well as encompassing energy efficiency. Examples of conservation without efficiency improvements would be heating a room less in winter, driving less, or working in a less brightly lit room. As with other definitions, the boundary between efficient energy use and energy conservation can be fuzzy, but both are important in environmental and economic terms. This is especially the case when actions are directed at the saving of fossil fuels. Reducing energy use is seen as a key solution to the problem of reducing greenhouse gas emissions. According to the International Energy Agency, improved energy efficiency in buildings, industrial processes and transportation could reduce the world's energy needs in 2050 by one third, and help control global emissions of greenhouse gases. Fuel switching on the demand side refers to changing the type of fuel used to satisfy a need for an energy service. To meet deep decarbonization goals, like the 80% reduction by 2050 goal being discussed in California and the European Union, many primary energy changes are needed. Energy efficiency alone may not be sufficient to meet these goals, switching fuels used on the demand side will help lower carbon emissions. Progressively coal, oil and eventually natural gas for space and water heating in buildings will need to be reduced. For an equivalent amount of heat, burning natural gas produces about 45 per cent less carbon dioxide than burning coal. There are various ways in which this could happen, and different strategies will likely make sense in different locations. While the system efficiency of a gas furnace may be higher than the combination of natural gas power plant and electric heat, the combination of the same natural gas power plant and an electric heat pump has lower emissions per unit of heat delivered in all but the coldest climates. This is possible because of the very efficient coefficient of performance of heat pumps. At the beginning of this century 70% of all electricity was generated by fossil fuels, and as carbon free sources eventually make up half of the generation mix, replacing gas or oil furnaces and water heaters with electric ones will have a climate benefit. In areas like Norway, Brazil, and Quebec that have abundant hydroelectricity, electric heat and hot water are common. The economics of switching the demand side from fossil fuels to electricity for heating, will depend on the price of fuels vs electricity and the relative prices of the equipment. The EIA Annual Energy Outlook 2014 suggests that domestic gas prices will rise faster than electricity prices which will encourage electrification in the coming decades. Electrifying heating loads may also provide a flexible resource that can participate in demand response. Since thermostatically controlled loads have inherent energy storage, electrification of heating could provide a valuable resource to integrate variable renewable resources into the grid. Alternatives to electrification, include decarbonizing pipeline gas through power to gas, biogas, or other carbon-neutral fuels. A 2015 study by Energy+Environmental Economics shows that a hybrid approach of decarbonizing pipeline gas, electrification, and energy efficiency can meet carbon reduction goals at a similar cost as only electrification and energy efficiency in Southern California. Expanding intermittent electrical sources such as wind power, creates a growing problem balancing grid fluctuations. Some of the plans include building pumped storage or continental super grids costing billions of dollars. However instead of building for more power, there are a variety of ways to affect the size and timing of electricity demand on the consumer side. Designing for reduced demands on a smaller power grid is more efficient and economic than having extra generation and transmission for intermittentcy, power failures and peak demands. Having these abilities is one of the chief aims of a smart grid. Time of use metering is a common way to motivate electricity users to reduce their peak load consumption. For instance, running dishwashers and laundry at night after the peak has passed, reduces electricity costs. Dynamic demand plans have devices passively shut off when stress is sensed on the electrical grid. This method may work very well with thermostats, when power on the grid sags a small amount, a low power temperature setting is automatically selected reducing the load on the grid. For instance millions of refrigerators reduce their consumption when clouds pass over solar installations. Consumers would need to have a smart meter in order for the utility to calculate credits. Demand response devices could receive all sorts of messages from the grid. The message could be a request to use a low power mode similar to dynamic demand, to shut off entirely during a sudden failure on the grid, or notifications about the current and expected prices for power. This would allow electric cars to recharge at the least expensive rates independent of the time of day. The vehicle-to-grid suggestion would use a car's battery or fuel cell to supply the grid temporarily. The 22,500 MW nameplate capacity Three Gorges Dam in the People's Republic of China, the largest hydroelectric power station in the world. The Shepherds Flat Wind Farm is an 845 megawatt (MW) nameplate capacity, wind farm in the US state of Oregon, each turbine is a nameplate 2 or 2.5 MW electricity generator. The 150 MW Andasol solar power station is a commercial parabolic trough solar thermal power plant, located in Spain. The Andasol plant uses tanks of molten salt to store solar energy so that it can continue generating electricity for 7.5 hours after the sun has stopped shining. 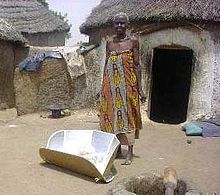 Solar cookers use sunlight as energy source for outdoor cooking. Renewable energy is derived from natural processes that are replenished constantly. In its various forms, it derives directly from the sun, or from heat generated deep within the earth. Included in the definition is electricity and heat generated from solar, wind, ocean, hydropower, biomass, geothermal resources, and biofuels and hydrogen derived from renewable resources. Climate change concerns and the need to reduce carbon emissions are driving increasing growth in the renewable energy industries. Low-carbon renewable energy replaces conventional fossil fuels in three main areas: power generation, hot water/ space heating, and transport fuels. In 2011, the share of renewables in electricity generation worldwide grew for the fourth year in a row to 20.2%. Based on REN21's 2014 report, renewables contributed 19% to supply global energy consumption. This energy consumption is divided as 9% coming from burning biomass, 4.2% as heat energy (non-biomass), 3.8% hydro electricity and 2% as electricity from wind, solar, geothermal, and biomass thermal power plants. Renewable energy use has grown much faster than anyone anticipated. The Intergovernmental Panel on Climate Change (IPCC) has said that there are few fundamental technological limits to integrating a portfolio of renewable energy technologies to meet most of total global energy demand. At the national level, at least 30 nations around the world already have renewable energy contributing more than 20% of energy supply. As of 2012, renewable energy accounts for almost half of new electricity capacity installed and costs are continuing to fall. Public policy and political leadership helps to "level the playing field" and drive the wider acceptance of renewable energy technologies. As of 2011[update], 118 countries have targets for their own renewable energy futures, and have enacted wide-ranging public policies to promote renewables. Leading renewable energy companies include BrightSource Energy, First Solar, Gamesa, GE Energy, Goldwind, Sinovel, Suntech, Trina Solar, Vestas, and Yingli. The incentive to use 100% renewable energy has been created by global warming and other ecological as well as economic concerns. Mark Z. Jacobson says producing all new energy with wind power, solar power, and hydropower by 2030 is feasible and existing energy supply arrangements could be replaced by 2050. Barriers to implementing the renewable energy plan are seen to be "primarily social and political, not technological or economic". Jacobson says that energy costs with a wind, solar, water system should be similar to today's energy costs. According to a 2011 projection by the (IEA)International Energy Agency, solar power generators may produce most of the world's electricity within 50 years, dramatically reducing harmful greenhouse gas emissions. Critics of the "100% renewable energy" approach include Vaclav Smil and James E. Hansen. Smil and Hansen are concerned about the variable output of solar and wind power, NIMBYism, and a lack of infrastructure. Economic analysts expect market gains for renewable energy (and efficient energy use) following the 2011 Japanese nuclear accidents. In his 2012 State of the Union address, President Barack Obama restated his commitment to renewable energy and mentioned the long-standing Interior Department commitment to permit 10,000 MW of renewable energy projects on public land in 2012. Globally, there are an estimated 3 million direct jobs in renewable energy industries, with about half of them in the biofuels industry. Since about 2001 the term "nuclear renaissance" has been used to refer to a possible nuclear power industry revival, driven by rising fossil fuel prices and new concerns about meeting greenhouse gas emission limits. However, in March 2011 the Fukushima nuclear disaster in Japan and associated shutdowns at other nuclear facilities raised questions among some commentators over the future of nuclear power. Platts has reported that "the crisis at Japan's Fukushima nuclear plants has prompted leading energy-consuming countries to review the safety of their existing reactors and cast doubt on the speed and scale of planned expansions around the world". The World Nuclear Association has reported that nuclear electricity generation in 2012 was at its lowest level since 1999. Several previous international studies and assessments, suggested that as part of the portfolio of other low-carbon energy technologies, nuclear power will continue to play a role in reducing greenhouse gas emissions. Historically, nuclear power usage is estimated to have prevented the atmospheric emission of 64 gigatonnes of CO2-equivalent as of 2013. Public concerns about nuclear power include the fate of spent nuclear fuel, nuclear accidents, security risks, nuclear proliferation, and a concern that nuclear power plants are very expensive. Of these concerns, nuclear accidents and disposal of long-lived radioactive fuel/"waste" have probably had the greatest public impact worldwide. Although generally unaware of it, both of these glaring public concerns are greatly diminished by present passive safety designs, the experimentally proven, "melt-down proof" EBR-II, future molten salt reactors, and the use of conventional and more advanced fuel/"waste" pyroprocessing, with the latter recycling or reprocessing not presently being commonplace as it is often considered to be cheaper to use a once-through nuclear fuel cycle in many countries, depending on the varying levels of intrinsic value given by a society in reducing the long-lived waste in their country, with France doing a considerable amount of reprocessing when compared to the US. Nuclear power, with a 10.6% share of world electricity production as of 2013, is second only to hydroelectricity as the largest source of low-carbon power. Over 400 reactors generate electricity in 31 countries. 2-eq/kWh by 2050, with the latter high figure being derived from a "worst-case scenario" that is not "considered very robust" by the authors of the paper, as the "ore grade" in the scenario is lower than the uranium concentration in many lignite coal ashes. Although this future analyses primarily deals with extrapolations for present Generation II reactor technology, the same paper also summarizes the literature on "FBRs"/Fast Breeder Reactors, of which two are in operation as of 2014 with the newest being the BN-800, for these reactors it states that the "median life cycle GHG emissions ... [are] similar to or lower than [present light water reactors] LWRs and purports to consume little or no uranium ore. In 2014, Brookings Institution published The Net Benefits of Low and No-Carbon Electricity Technologies which states, after performing an energy and emissions cost analysis, that "The net benefits of new nuclear, hydro, and natural gas combined cycle plants far outweigh the net benefits of new wind or solar plants", with the most cost effective low carbon power technology being determined to be nuclear power. During his presidential campaign, Barack Obama stated, "Nuclear power represents more than 70% of our noncarbon generated electricity. It is unlikely that we can meet our aggressive climate goals if we eliminate nuclear power as an option." This graph illustrates nuclear power is the United States's largest contributor of non-greenhouse-gas-emitting electric power generation, comprising nearly three-quarters of the non-emitting sources. Analysis in 2015 by Professor and Chair of Environmental Sustainability Barry W. Brook and his colleagues on the topic of replacing fossil fuels entirely, from the electric grid of the world, has determined that at the historically modest and proven-rate at which nuclear energy was added to and replaced fossil fuels in France and Sweden during each nation's building programs in the 1980s, within 10 years nuclear energy could displace or remove fossil fuels from the electric grid completely, "allow[ing] the world to meet the most stringent greenhouse-gas mitigation targets.". In a similar analysis, Brook had earlier determined that 50% of all global energy, that is not solely electricity, but transportation synfuels etc. could be generated within approximately 30 years, if the global nuclear fission build rate was identical to each of these nation's already proven decadal rates(in units of installed nameplate capacity, GW per year, per unit of global GDP (GW/year/$). This is in contrast to the completely conceptual paper-studies for a 100% renewable energy world, which would require an orders of magnitude more costly global investment per year, an investment rate that has no historical precedent, having never been attempted due to its prohibitive cost, and with far greater land area that would be required to be devoted to the wind, wave and solar projects, along with the inherent assumption that humanity will use less, and not more, energy in the future. As Brook notes the "principal limitations on nuclear fission are not technical, economic or fuel-related, but are instead linked to complex issues of societal acceptance, fiscal and political inertia, and inadequate critical evaluation of the real-world constraints facing [the other] low-carbon alternatives." Nuclear power may be uncompetitive compared with fossil fuel energy sources in countries without a carbon tax program, and in comparison to a fossil fuel plant of the same power output, nuclear power plants take a longer amount of time to construct. Two new, first of their kind, EPR reactors under construction in Finland and France have been delayed and are running over-budget. However learning from experience, two further EPR reactors under construction in China are on, and ahead, of schedule respectively. As of 2013, according to the IAEA and the European Nuclear Society, worldwide there were 68 civil nuclear power reactors under construction in 15 countries. China has 29 of these nuclear power reactors under construction, as of 2013, with plans to build many more, while in the US the licenses of almost half its reactors have been extended to 60 years, and plans to build another dozen are under serious consideration. There are also a considerable number of new reactors being built in South Korea, India, and Russia. At least 100 older and smaller reactors will "most probably be closed over the next 10–15 years". This is probable only if one does not factor in the ongoing Light Water Reactor Sustainability Program, created to permit the extension of the life span of the USA's 104 nuclear reactors to 60 years. The licenses of almost half of the USA's reactors have been extended to 60 years as of 2008. Two new "passive safety" AP1000 reactors are, as of 2013, being constructed at Vogtle Electric Generating Plant. Public opinion about nuclear power varies widely between countries. A poll by Gallup International (2011) assessed public opinion in 47 countries. The poll was conducted following a tsunami and earthquake which caused an accident at the Fukushima nuclear power plant in Japan. 49% stated that they held favourable views about nuclear energy, while 43% held an unfavourable view. Another global survey by Ipsos (2011) assessed public opinion in 24 countries. Respondents to this survey showed a clear preference for renewable energy sources over coal and nuclear energy (refer to graph opposite). Ipsos (2012) found that solar and wind were viewed by the public as being more environmentally friendly and more viable long-term energy sources relative to nuclear power and natural gas. However, solar and wind were viewed as being less reliable relative to nuclear power and natural gas. In 2012 a poll done in the UK found that 63% of those surveyed support nuclear power, and with opposition to nuclear power at 11%. In Germany, strong anti-nuclear sentiment led to eight of the seventeen operating reactors being permanently shut down following the March 2011 Fukushima nuclear disaster. Nuclear fusion research, in the form of the International Thermonuclear Experimental Reactor is underway. Fusion powered electricity generation was initially believed to be readily achievable, as fission power had been. However, the extreme requirements for continuous reactions and plasma containment led to projections being extended by several decades. In 2010, more than 60 years after the first attempts, commercial power production was still believed to be unlikely before 2050. Although rather than an either, or, issue economical fusion-fission hybrid reactors could be built before any attempt at this more demanding commercial "pure-fusion reactor"/DEMO reactor takes place. Most mitigation proposals imply—rather than directly state—an eventual reduction in global fossil fuel production. Also proposed are direct quotas on global fossil fuel production. 2 and methane—CH4) than coal when burned at power plants, but evidence has been emerging that this benefit could be completely negated by methane leakage at gas drilling fields and other points in the supply chain. A study performed by the Environmental Protection Agency (EPA) and the Gas Research Institute (GRI) in 1997 sought to discover whether the reduction in carbon dioxide emissions from increased natural gas (predominantly methane) use would be offset by a possible increased level of methane emissions from sources such as leaks and emissions. The study concluded that the reduction in emissions from increased natural gas use outweighs the detrimental effects of increased methane emissions. More recent peer-reviewed studies have challenged the findings of this study, with researchers from the National Oceanic and Atmospheric Administration (NOAA) reconfirming findings of high rates of methane (CH4) leakage from natural gas fields. 2 emissions. When gas replaces coal there is additional warming out to 2,050 with an assumed leakage rate of 0%, and out to 2,140 if the leakage rate is as high as 10%. The overall effects on global-mean temperature over the 21st century, however, are small. Petron et al. (2013) and Alvarez et al. (2012) note that estimated that leakage from gas infrastructure is likely to be underestimated. These studies indicate that the exploitation of natural gas as a "cleaner" fuel is questionable. A 2014 meta-study of 20 years of natural gas technical literature shows that methane emissions are consistently underestimated but on a 100-year scale, the climate benefits of coal to gas fuel switching are likely larger than the negative effects of natural gas leakage. A heat pump is a device that provides heat energy from a source of heat to a destination called a "heat sink". Heat pumps are designed to move thermal energy opposite to the direction of spontaneous heat flow by absorbing heat from a cold space and releasing it to a warmer one. A heat pump uses some amount of external power to accomplish the work of transferring energy from the heat source to the heat sink. While air conditioners and freezers are familiar examples of heat pumps, the term "heat pump" is more general and applies to many HVAC (heating, ventilating, and air conditioning) devices used for space heating or space cooling. When a heat pump is used for heating, it employs the same basic refrigeration-type cycle used by an air conditioner or a refrigerator, but in the opposite direction—releasing heat into the conditioned space rather than the surrounding environment. 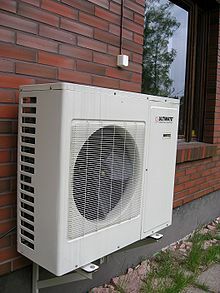 In this use, heat pumps generally draw heat from the cooler external air or from the ground. In heating mode, heat pumps are three to four times more efficient in their use of electric power than simple electrical resistance heaters. 2 emissions in Europe in 2050 and make handling high shares of renewable energy easier. Using surplus renewable energy in heat pumps is regarded as the most effective household means to reduce global warming and fossil fuel depletion. With significant amounts of fossil fuel used in electricity production, demands on the electrical grid also generate greenhouse gases. Without a high share of low-carbon electricity, a domestic heat pump will produce more carbon emissions than using natural gas. Fossil fuel may be phased-out with carbon-neutral and carbon-negative pipeline and transportation fuels created with power to gas and gas to liquids technologies. Carbon dioxide from fossil fuel flue gas can be used to produce plastic lumber allowing carbon negative reforestation. A carbon sink is a natural or artificial reservoir that accumulates and stores some carbon-containing chemical compound for an indefinite period, such as a growing forest. A negative carbon dioxide emission on the other hand is a permanent removal of carbon dioxide out of the atmosphere. Examples are direct air capture, enhanced weathering technologies such as storing it in geologic formations underground and biochar. These processes are sometimes considered as variations of sinks or mitigation, and sometimes as geoengineering. In combination with other mitigation measures, sinks in combination with negative carbon emissions are considered crucial for meeting the 350 ppm target. 2 are absorbed by the oceans. However, this also leads to ocean acidification, with potentially significant impacts on marine life. Acidification lowers the level of carbonate ions available for calcifying organisms to form their shells. These organisms include plankton species that contribute to the foundation of the Southern Ocean food web. However acidification may impact on a broad range of other physiological and ecological processes, such as fish respiration, larval development and changes in the solubility of both nutrients and toxins. Transferring land rights to indigenous inhabitants is argued to efficiently conserve forests. Almost 20 percent (8 GtCO2/year) of total greenhouse-gas emissions were from deforestation in 2007. It is estimated that avoided deforestation reduces CO2 emissions at a rate of 1 tonne of CO2 per $1–5 in opportunity costs from lost agriculture. Reforestation could save at least another 1 GtCO2/year, at an estimated cost of $5–15/tCO2. Afforestation is where there was previously no forest - such plantations are estimated to have to be prohibitively massive to be reduce emissions by itself. Transferring rights over land from public domain to its indigenous inhabitants, who have had a stake for millennia in preserving the forests that they depend on, is argued to be a cost effective strategy to conserve forests. This includes the protection of such rights entitled in existing laws, such as India's Forest Rights Act. The transferring of such rights in China, perhaps the largest land reform in modern times, has been argued to have increased forest cover. Granting title of the land has shown to have two or three times less clearing than even state run parks, notably in the Brazilian Amazon. Excluding humans and even evicting inhabitants from protected areas (called "fortress conservation"), sometimes as a result of lobbying by environmental groups, often lead to more exploitation of the land as the native inhabitants then turn to work for extractive companies to survive. With increased intensive agriculture and urbanization, there is an increase in the amount of abandoned farmland. By some estimates, for every half a hectare of original old-growth forest cut down, more than 20 hectares of new secondary forests are growing, even though they do not have the same biodiversity as the original forests and original forests store 60% more carbon than these new secondary forests. According to a study in Science, promoting regrowth on abandoned farmland could offset years of carbon emissions. Managed grazing methods are argued to be able to restore grasslands, thereby significantly decreasing atmospheric CO2 levels. Restoring grasslands store CO2 from the air into plant material. 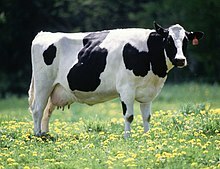 Grazing livestock, usually not left to wander, would eat the grass and would minimize any grass growth. However, grass left alone would eventually grow to cover its own growing buds, preventing them from photosynthesizing and the dying plant would stay in place. A method proposed to restore grasslands uses fences with many small paddocks and moving herds from one paddock to another after a day a two in order to mimick natural grazers and allowing the grass to grow optimally. Additionally, when part of leaf matter is consumed by a herding animal, a corresponding amount of root matter is sloughed off too as it would not be able to sustain the previous amount of root matter and while most of the lost root matter would rot and enter the atmosphere, part of the carbon is sequestered into the soil. It is estimated that increasing the carbon content of the soils in the world's 3.5 billion hectares of agricultural grassland by 1% would offset nearly 12 years of CO2 emissions. Allan Savory, as part of holistic management, claims that while large herds are often blamed for desertification, prehistoric lands supported large or larger herds and areas where herds were removed in the United States are still desertifying. Additionally, the global warming induced thawing of the permafrost, which stores about two times the amount of the carbon currently released in the atmosphere, releases the potent greenhouse gas, methane, in a positive feedback cycle that is feared to lead to a tipping point called runaway climate change. A method proposed to prevent such a scenario is to bring back large herbivores such as seen in Pleistocene Park, where their trampling naturally keep the ground cooler by eliminating shrubs and keeping the ground exposed to the cold air. 2 storage capacity of all 14 projects in operation or under construction is over 33 million tonnes a year. This is broadly equivalent to preventing the emissions from more than six million cars from entering the atmosphere each year. According to a Sierra Club analysis, the US coal fired Kemper Project due to be online in 2017, is the most expensive power plant ever built for the watts of electricity it will generate. Enhanced weathering is the removal of carbon from the air into the earth, enhancing the natural carbon cycle where carbon is mineralized into rock. The CarbFix project couples with carbon capture and storage in power plants to turn carbon dioxide into stone in a relatively short period of two years, addressing the common concern of leakage in CCS projects. While this project used basalt rocks, olivine has also shown promise. Geoengineering is seen by Olivier Sterck as an alternative to mitigation and adaptation, but by Gernot Wagner as an entirely separate response to climate change. In a literature assessment, Barker et al. (2007) described geoengineering as a type of mitigation policy. IPCC (2007) concluded that geoengineering options, such as ocean fertilization to remove CO2 from the atmosphere, remained largely unproven. It was judged that reliable cost estimates for geoengineering had not yet been published. Chapter 28 of the National Academy of Sciences report Policy Implications of Greenhouse Warming: Mitigation, Adaptation, and the Science Base (1992) defined geoengineering as "options that would involve large-scale engineering of our environment in order to combat or counteract the effects of changes in atmospheric chemistry." They evaluated a range of options to try to give preliminary answers to two questions: can these options work and could they be carried out with a reasonable cost. They also sought to encourage discussion of a third question — what adverse side effects might there be. The following types of option were examined: reforestation, increasing ocean absorption of carbon dioxide (carbon sequestration) and screening out some sunlight. NAS also argued "Engineered countermeasures need to be evaluated but should not be implemented without broad understanding of the direct effects and the potential side effects, the ethical issues, and the risks." In July 2011 a report by the United States Government Accountability Office on geoengineering found that "[c]limate engineering technologies do not now offer a viable response to global climate change." Carbon dioxide removal has been proposed as a method of reducing the amount of radiative forcing. A variety of means of artificially capturing and storing carbon, as well as of enhancing natural sequestration processes, are being explored. The main natural process is photosynthesis by plants and single-celled organisms (see biosequestration). Artificial processes vary, and concerns have been expressed about the long-term effects of some of these processes. It is notable that the availability of cheap energy and appropriate sites for geological storage of carbon may make carbon dioxide air capture viable commercially. It is, however, generally expected that carbon dioxide air capture may be uneconomic when compared to carbon capture and storage from major sources — in particular, fossil fuel powered power stations, refineries, etc. As in the case of the US Kemper Project with carbon capture, costs of energy produced will grow significantly. However, captured CO2 can be used to force more crude oil out of oil fields, as Statoil and Shell have made plans to do. CO2 can also be used in commercial greenhouses, giving an opportunity to kick-start the technology. Some attempts have been made to use algae to capture smokestack emissions, notably the GreenFuel Technologies Corporation, who have now shut down operations. The main purpose of solar radiation management seek to reflect sunlight and thus reduce global warming. The ability of stratospheric sulfate aerosols to create a global dimming effect has made them a possible candidate for use in climate engineering projects. CO2 is not the only GHG relevant to mitigation, and governments have acted to regulate the emissions of other GHGs emitted by human activities (anthropogenic GHGs). 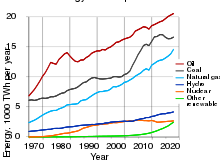 The emissions caps agreed to by most developed countries under the Kyoto Protocol regulate the emissions of almost all the anthropogenic GHGs. These gases are CO2, methane (CH4), nitrous oxide (N2O), the hydrofluorocarbons (HFC), perfluorocarbons (PFC), and sulfur hexafluoride (SF6). Stabilizing the atmospheric concentrations of the different anthropogenic GHGs requires an understanding of their different physical properties. Stabilization depends both on how quickly GHGs are added to the atmosphere and how fast they are removed. The rate of removal is measured by the atmospheric lifetime of the GHG in question (see the main GHG article for a list). Here, the lifetime is defined as the time required for a given perturbation of the GHG in the atmosphere to be reduced to 37% of its initial amount. Methane has a relatively short atmospheric lifetime of about 12 years, while N2O's lifetime is about 110 years. For methane, a reduction of about 30% below current emission levels would lead to a stabilization in its atmospheric concentration, while for N2O, an emissions reduction of more than 50% would be required. Methane is a significantly more potent greenhouse gas than carbon dioxide in the amount of heat it can trap, especially in the short term. Burning one molecule of methane generates one molecule of carbon dioxide, indicating there may be no net benefit in using gas as a fuel source. Reducing the amount of waste methane produced in the first place and moving away from use of gas as a fuel source will have a greater beneficial impact, as might other approaches to productive use of otherwise-wasted methane. In terms of prevention, vaccines are being developed in Australia to reduce the significant global warming contributions from methane released by livestock via flatulence and eructation. Another physical property of the anthropogenic GHGs relevant to mitigation is the different abilities of the gases to trap heat (in the form of infrared radiation). Some gases are more effective at trapping heat than others, e.g., SF6 is 22,200 times more effective a GHG than CO2 on a per-kilogram basis. A measure for this physical property is the global warming potential (GWP), and is used in the Kyoto Protocol. Although not designed for this purpose, the Montreal Protocol has probably benefited climate change mitigation efforts. The Montreal Protocol is an international treaty that has successfully reduced emissions of ozone-depleting substances (for example, CFCs), which are also greenhouse gases. The Tesla Roadster (2008) emits no tailpipe emissions, uses lithium ion batteries to achieve 220 mi (350 km) per charge, while also capable of going 0–60 in under 4 seconds. Bicycles have almost no carbon footprint compared to cars, and canal transport may represent a positive option for certain types of freight in the 21st century. Transportation emissions account for roughly 1/4 of emissions worldwide, and are even more important in terms of impact in developed nations especially in North America and Australia. Many citizens of countries like the United States and Canada who drive personal cars often, see well over half of their climate change impact stemming from the emissions produced from their cars. Modes of mass transportation such as bus, light rail (metro, subway, etc. ), and long-distance rail are far and away the most energy-efficient means of motorized transportation for passengers, able to use in many cases over twenty times less energy per person-distance than a personal automobile. Modern energy-efficient technologies, such as plug-in hybrid electric vehicles and carbon-neutral synthetic gasoline & Jet fuel may also help to reduce the consumption of petroleum, land use changes and emissions of carbon dioxide. Utilizing rail transport, especially electric rail, over the far less efficient air transport and truck transport significantly reduces emissions. With the use of electric trains and cars in transportation there is the opportunity to run them with low-carbon power, producing far fewer emissions. Effective urban planning to reduce sprawl aims to decrease Vehicle Miles Travelled (VMT), lowering emissions from transportation. Personal cars are extremely inefficient at moving passengers, while public transport and bicycles are many times more efficient (as is the simplest form of human transportation, walking). All of these are encouraged by urban/community planning and are an effective way to reduce greenhouse gas emissions. Between 1982 and 1997, the amount of land consumed for urban development in the United States increased by 47 percent while the nation's population grew by only 17 percent. Inefficient land use development practices have increased infrastructure costs as well as the amount of energy needed for transportation, community services, and buildings. At the same time, a growing number of citizens and government officials have begun advocating a smarter approach to land use planning. These smart growth practices include compact community development, multiple transportation choices, mixed land uses, and practices to conserve green space. These programs offer environmental, economic, and quality-of-life benefits; and they also serve to reduce energy usage and greenhouse gas emissions. Approaches such as New Urbanism and transit-oriented development seek to reduce distances travelled, especially by private vehicles, encourage public transit and make walking and cycling more attractive options. This is achieved through "medium-density", mixed-use planning and the concentration of housing within walking distance of town centers and transport nodes. Smarter growth land use policies have both a direct and indirect effect on energy consuming behavior. For example, transportation energy usage, the number one user of petroleum fuels, could be significantly reduced through more compact and mixed use land development patterns, which in turn could be served by a greater variety of non-automotive based transportation choices. Emissions from housing are substantial, and government-supported energy efficiency programmes can make a difference. For institutions of higher learning in the United States, greenhouse gas emissions depend primarily on total area of buildings and secondarily on climate. If climate is not taken into account, annual greenhouse gas emissions due to energy consumed on campuses plus purchased electricity can be estimated with the formula, E=aSb, where a =0.001621 metric tonnes of CO2 equivalent/square foot or 0.0241 metric tonnes of CO2 equivalent/square meter and b= 1.1354. New buildings can be constructed using passive solar building design, low-energy building, or zero-energy building techniques, using renewable heat sources. Existing buildings can be made more efficient through the use of insulation, high-efficiency appliances (particularly hot water heaters and furnaces), double- or triple-glazed gas-filled windows, external window shades, and building orientation and siting. Renewable heat sources such as shallow geothermal and passive solar energy reduce the amount of greenhouse gasses emitted. In addition to designing buildings which are more energy-efficient to heat, it is possible to design buildings that are more energy-efficient to cool by using lighter-coloured, more reflective materials in the development of urban areas (e.g. by painting roofs white) and planting trees. This saves energy because it cools buildings and reduces the urban heat island effect thus reducing the use of air conditioning. 2O emissions include fertilizer usage, irrigation, and tillage. The management of soils accounts for over half of the emissions from the Agriculture sector. Cattle livestocks account for one third of emissions, through methane emissions. Manure management and rice cultivation also produce gaseous emissions. Methods that significantly enhance carbon sequestration in soil include no-till farming, residue mulching, cover cropping, and crop rotation, all of which are more widely used in organic farming than in conventional farming. Because only 5% of US farmland currently uses no-till and residue mulching, there is a large potential for carbon sequestration. A 2015 study found that farming can deplete soil carbon and render soil incapable of supporting life; however, the study also showed that conservation farming can protect carbon in soils, and repair damage over time. The farming practise of cover crops has been recognized as climate-smart agriculture by the White House. In Europe the estimation of the current 0–30 cm SOC stock of agricultural soils was 17.63 Gt. In a subsequent study, authors estimated the best management practices to mitigate soil organic carbon: conversion of arable land to grassland (and vice versa), straw incorporation, reduced tillage, straw incorporation combined with reduced tillage, ley cropping system and cover crops. Another method being examined is to make carbon a new currency by introducing tradeable "personal carbon credits". The idea being it will encourage and motivate individuals to reduce their 'carbon footprint' by the way they live. Each citizen will receive a free annual quota of carbon that they can use to travel, buy food, and go about their business. It has been suggested that by using this concept it could actually solve two problems; pollution and poverty, old age pensioners will actually be better off because they fly less often, so they can cash in their quota at the end of the year to pay heating bills and so forth. Various organizations promote population control as a means for mitigating global warming. Proposed measures include improving access to family planning and reproductive health care and information, reducing natalistic politics, public education about the consequences of continued population growth, and improving access of women to education and economic opportunities. According to a 2017 study published in Environmental Research Letters, having one less child would have a much more substantial effect on greenhouse gas emissions compared with for example living car free or eating a plant-based diet. Population control efforts are impeded by there being somewhat of a taboo in some countries against considering any such efforts. Also, various religions discourage or prohibit some or all forms of birth control. Population size has a different per capita effect on global warming in different countries, since the per capita production of anthropogenic greenhouse gases varies greatly by country. The Stern Review proposes stabilising the concentration of greenhouse-gas emissions in the atmosphere at a maximum of 550ppm CO2e by 2050. The Review estimates that this would mean cutting total greenhouse-gas emissions to three quarters of 2007 levels. The Review further estimates that the cost of these cuts would be in the range −1.0 to +3.5% of World GDP, (i.e. GWP), with an average estimate of approximately 1%. Stern has since revised his estimate to 2% of GWP. For comparison, the Gross World Product (GWP) at PPP was estimated at $74.5 trillion in 2010, thus 2% is approximately $1.5 trillion. The Review emphasises that these costs are contingent on steady reductions in the cost of low-carbon technologies. Mitigation costs will also vary according to how and when emissions are cut: early, well-planned action will minimise the costs. One way of estimating the cost of reducing emissions is by considering the likely costs of potential technological and output changes. Policy makers can compare the marginal abatement costs of different methods to assess the cost and amount of possible abatement over time. The marginal abatement costs of the various measures will differ by country, by sector, and over time. Yohe et al. (2007) assessed the literature on sustainability and climate change. With high confidence, they suggested that up to the year 2050, an effort to cap greenhouse gas (GHG) emissions at 550 ppm would benefit developing countries significantly. This was judged to be especially the case when combined with enhanced adaptation. By 2100, however, it was still judged likely that there would be significant effects of global warming. This was judged to be the case even with aggressive mitigation and significantly enhanced adaptive capacity. One of the aspects of mitigation is how to share the costs and benefits of mitigation policies. There is no scientific consensus over how to share these costs and benefits (Toth et al., 2001). In terms of the politics of mitigation, the UNFCCC's ultimate objective is to stabilize concentrations of GHG in the atmosphere at a level that would prevent "dangerous" climate change (Rogner et al., 2007). 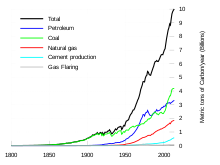 GHG emissions are an important correlate of wealth, at least at present (Banuri et al., 1996, pp. 91–92). Wealth, as measured by per capita income (i.e., income per head of population), varies widely between different countries. Activities of the poor that involve emissions of GHGs are often associated with basic needs, such as heating to stay tolerably warm. In richer countries, emissions tend to be associated with things like cars, central heating, etc. The impacts of cutting emissions could therefore have different impacts on human welfare according to wealth. Egalitarianism: this system interprets the problem as one where each person has equal rights to a global resource, i.e., polluting the atmosphere. Basic needs: this system would have emissions allocated according to basic needs, as defined according to a minimum level of consumption. Consumption above basic needs would require countries to buy more emission rights. From this viewpoint, developing countries would need to be at least as well off under an emissions control regime as they would be outside the regime. Historical responsibilities: this asserts that allocation of emission rights should be based on patterns of past emissions. Two-thirds of the stock of GHGs in the atmosphere at present is due to the past actions of developed countries (Goldemberg et al., 1996, p. 29). Comparable burdens and ability to pay: with this approach, countries would reduce emissions based on comparable burdens and their ability to take on the costs of reduction. Ways to assess burdens include monetary costs per head of population, as well as other, more complex measures, like the UNDP's Human Development Index. Willingness to pay: with this approach, countries take on emission reductions based on their ability to pay along with how much they benefit from reducing their emissions. Ad hoc: Lashof (1992) and Cline (1992) (referred to by Banuri et al., 1996, p. 106), for example, suggested that allocations based partly on GNP could be a way of sharing the burdens of emission reductions. This is because GNP and economic activity are partially tied to carbon emissions. Equal per capita entitlements: this is the most widely cited method of distributing abatement costs, and is derived from egalitarianism (Banuri et al., 1996, pp. 106–107). This approach can be divided into two categories. In the first category, emissions are allocated according to national population. In the second category, emissions are allocated in a way that attempts to account for historical (cumulative) emissions. Status quo: with this approach, historical emissions are ignored, and current emission levels are taken as a status quo right to emit (Banuri et al., 1996, p. 107). An analogy for this approach can be made with fisheries, which is a common, limited resource. The analogy would be with the atmosphere, which can be viewed as an exhaustible natural resource (Goldemberg et al., 1996, p. 27). In international law, one state recognized the long-established use of another state's use of the fisheries resource. It was also recognized by the state that part of the other state's economy was dependent on that resource. Many countries, both developing and developed, are aiming to use cleaner technologies (World Bank, 2010, p. 192). Use of these technologies aids mitigation and could result in substantial reductions in CO2 emissions. Policies include targets for emissions reductions, increased use of renewable energy, and increased energy efficiency. It is often argued that the results of climate change are more damaging in poor nations, where infrastructures are weak and few social services exist. The Commitment to Development Index is one attempt to analyze rich country policies taken to reduce their disproportionate use of the global commons. Countries do well if their greenhouse gas emissions are falling, if their gas taxes are high, if they do not subsidize the fishing industry, if they have a low fossil fuel rate per capita, and if they control imports of illegally cut tropical timber. The main current international agreement on combating climate change is the Kyoto Protocol. On the 11th of December 1997 it was implemented by the 3rd conference of parties, which was coming together in kyoto, which came into force on 16 February 2005. The Kyoto Protocol is an amendment to the United Nations Framework Convention on Climate Change (UNFCCC). Countries that have ratified this protocol have committed to reduce their emissions of carbon dioxide and five other greenhouse gases, or engage in emissions trading if they maintain or increase emissions of these gases. For Kyoto reporting, governments are obliged to be told on the present state of the countries forests and the related ongoing processes. The graph on the right shows three "pathways" to meet the UNFCCC's 2 °C target, labelled "global technology", "decentralised solutions", and "consumption change". Each pathway shows how various measures (e.g., improved energy efficiency, increased use of renewable energy) could contribute to emissions reductions. Image credit: PBL Netherlands Environmental Assessment Agency. Actions to mitigate climate change are sometimes based on the goal of achieving a particular temperature target. One of the targets that has been suggested is to limit the future increase in global mean temperature (global warming) to below 2 °C, relative to the pre-industrial level. The 2 °C target was adopted in 2010 by Parties to the United Nations Framework Convention on Climate Change. Most countries of the world are Parties to the UNFCCC. The target had been adopted in 1996 by the European Union Council. Temperatures have increased by 0.8 °C compared to the pre-industrial level, and another 0.5–0.7 °C is already committed. The 2 °C rise is typically associated in climate models with a carbon dioxide equivalent concentration of 400–500 ppm by volume; the current (January 2015) level of carbon dioxide alone is 400 ppm by volume, and rising at 1–3 ppm annually. Hence, to avoid a very likely breach of the 2 °C target, CO2 levels would have to be stabilised very soon; this is generally regarded as unlikely, based on current programs in place to date. The importance of change is illustrated by the fact that world economic energy efficiency is improving at only half the rate of world economic growth. Policies adopted by parties to the UNFCCC are too weak to meet a 2 or 1.5 °C target. However, these targets might still be achievable if more stringent mitigation policies are adopted immediately. Cost-effective 2 °C scenarios project annual global greenhouse gas emissions to peak before the year 2020, with deep cuts in emissions thereafter, leading to a reduction in 2050 of 41% compared to 1990 levels. Scientific analysis can provide information on the impacts of climate change and associated policies, such as reducing GHG emissions. However, deciding what policies are best requires value judgements. For example, limiting global warming to 1 °C relative to pre-industrial levels may help to reduce climate change damages more than a 2 °C limit. However, a 1 °C limit may be more costly to achieve than a 2 °C limit. According to some analysts, the 2 °C "guardrail" is inadequate for the needed degree and timeliness of mitigation. On the other hand, some economic studies suggest more modest mitigation policies. For example, the emissions reductions proposed by Nordhaus (2010) might lead to global warming (in the year 2100) of around 3 °C, relative to pre-industrial levels. In 2015, two official UNFCCC scientific expert bodies came to the conclusion that, "in some regions and vulnerable ecosystems, high risks are projected even for warming above 1.5°C". This expert position was, together with the strong diplomatic voice of the poorest countries and the island nations in the Pacific, the driving force leading to the decision of the Paris Conference 2015, to lay down this 1.5 °C long-term target on top of the existing 2 °C goal. Citizens for climate action at the People's Climate March (2017). An emissions tax on greenhouse gas emissions requires individual emitters to pay a fee, charge or tax for every tonne of greenhouse gas released into the atmosphere. Most environmentally related taxes with implications for greenhouse gas emissions in OECD countries are levied on energy products and motor vehicles, rather than on CO2 emissions directly. Emission taxes can be both cost-effective and environmentally effective. Difficulties with emission taxes include their potential unpopularity, and the fact that they cannot guarantee a particular level of emissions reduction. Emissions or energy taxes also often fall disproportionately on lower income classes. In developing countries, institutions may be insufficiently developed for the collection of emissions fees from a wide variety of sources. According to Mark Z. Jacobson, a program of subsidization balanced against expected flood costs could pay for conversion to 100% renewable power by 2030. Jacobson, and his colleague Mark Delucchi, suggest that the cost to generate and transmit power in 2020 will be less than 4 cents per kilowatt hour (in 2007 dollars) for wind, about 4 cents for wave and hydroelectric, from 4 to 7 cents for geothermal, and 8 cents per kWh for solar, fossil, and nuclear power. Another indirect method of encouraging uses of renewable energy, and pursue sustainability and environmental protection, is that of prompting investment in this area through legal means, something that is already being done at national level as well as in the field of international investment. With the creation of a market for trading carbon dioxide emissions within the Kyoto Protocol, it is likely that London financial markets will be the centre for this potentially highly lucrative business; the New York and Chicago stock markets may have a lower trade volume than expected as long as the US maintains its rejection of the Kyoto. However, emissions trading may delay the phase-out of fossil fuels. In the north-east United States, a successful cap and trade program has shown potential for this solution. The European Union Emission Trading Scheme (EU ETS) is the largest multi-national, greenhouse gas emissions trading scheme in the world. It commenced operation on 1 January 2005, and all 28 member states of the European Union participate in the scheme which has created a new market in carbon dioxide allowances estimated at 35 billion Euros (US$43 billion) per year. The Chicago Climate Exchange was the first (voluntary) emissions market, and is soon to be followed by Asia's first market (Asia Carbon Exchange). A total of 107 million metric tonnes of carbon dioxide equivalent have been exchanged through projects in 2004, a 38% increase relative to 2003 (78 Mt CO2e). Twenty three multinational corporations have come together in the G8 Climate Change Roundtable, a business group formed at the January 2005 World Economic Forum. The group includes Ford, Toyota, British Airways, and BP. On 9 June 2005 the Group published a statement stating that there was a need to act on climate change and claiming that market-based solutions can help. It called on governments to establish "clear, transparent, and consistent price signals" through "creation of a long-term policy framework" that would include all major producers of greenhouse gases. The Regional Greenhouse Gas Initiative is a proposed carbon trading scheme being created by nine North-eastern and Mid-Atlantic American states; Connecticut, Delaware, Maine, Massachusetts, New Hampshire, New Jersey, New York, Rhode Island, and Vermont. The scheme was due to be developed by April 2005 but has not yet been completed. Implementation puts into effect climate change mitigation strategies and targets. These can be targets set by international bodies or voluntary action by individuals or institutions. This is the most important, expensive and least appealing aspect of environmental governance. Implementation requires funding sources but is often beset by disputes over who should provide funds and under what conditions. A lack of funding can be a barrier to successful strategies as there are no formal arrangements to finance climate change development and implementation. Funding is often provided by nations, groups of nations and increasingly NGO and private sources. These funds are often channelled through the Global Environmental Facility (GEF). This is an environmental funding mechanism in the World Bank which is designed to deal with global environmental issues. The GEF was originally designed to tackle four main areas: biological diversity, climate change, international waters and ozone layer depletion, to which land degradation and persistent organic pollutant were added. The GEF funds projects that are agreed to achieve global environmental benefits that are endorsed by governments and screened by one of the GEF's implementing agencies. There are numerous issues which result in a current perceived lack of implementation. It has been suggested that the main barriers to implementation are Uncertainty, Fragmentation, Institutional void, Short time horizon of policies and politicians and Missing motives and willingness to start adapting. The relationships between many climatic processes can cause large levels of uncertainty as they are not fully understood and can be a barrier to implementation. When information on climate change is held between the large numbers of actors involved it can be highly dispersed, context specific or difficult to access causing fragmentation to be a barrier. Institutional void is the lack of commonly accepted rules and norms for policy processes to take place, calling into question the legitimacy and efficacy of policy processes. The Short time horizon of policies and politicians often means that climate change policies are not implemented in favour of socially favoured societal issues. Statements are often posed to keep the illusion of political action to prevent or postpone decisions being made. Missing motives and willingness to start adapting is a large barrier as it prevents any implementation. The issues that arise with a system which involves international government cooperation, such as cap and trade, could potentially be improved with a polycentric approach where the rules are enforced by many small sections of authority as opposed to one overall enforcement agency. Concerns about metal requirement and/or availability for essential decarbonization technoloqies such as photovoltaics, nuclear power, and (plug-in hybrid) electric vehicles have also been expressed as obstacles. Despite a perceived lack of occurrence, evidence of implementation is emerging internationally. Some examples of this are the initiation of NAPA's and of joint implementation. Many developing nations have made National Adaptation Programs of Action (NAPAs) which are frameworks to prioritize adaption needs. The implementation of many of these is supported by GEF agencies. Many developed countries are implementing 'first generation' institutional adaption plans particularly at the state and local government scale. There has also been a push towards joint implementation between countries by the UNFCCC as this has been suggested as a cost-effective way for objectives to be achieved. Efforts to reduce greenhouse gas emissions by the United States include energy policies which encourage efficiency through programs like Energy Star, Commercial Building Integration, and the Industrial Technologies Program. On 12 November 1998, Vice President Al Gore symbolically signed the Kyoto Protocol, but he indicated participation by the developing nations was necessary prior its being submitted for ratification by the United States Senate. In 2007, Transportation Secretary Mary Peters, with White House approval, urged governors and dozens of members of the House of Representatives to block California's first-in-the-nation limits on greenhouse gases from cars and trucks, according to e-mails obtained by Congress. The US Climate Change Science Program is a group of about twenty federal agencies and US Cabinet Departments, all working together to address global warming. The Bush administration pressured American scientists to suppress discussion of global warming, according to the testimony of the Union of Concerned Scientists to the Oversight and Government Reform Committee of the US House of Representatives. "High-quality science" was "struggling to get out," as the Bush administration pressured scientists to tailor their writings on global warming to fit the Bush administration's skepticism, in some cases at the behest of an ex-oil industry lobbyist. "Nearly half of all respondents perceived or personally experienced pressure to eliminate the words 'climate change,' 'global warming' or other similar terms from a variety of communications." Similarly, according to the testimony of senior officers of the Government Accountability Project, the White House attempted to bury the report "National Assessment of the Potential Consequences of Climate Variability and Change," produced by US scientists pursuant to US law. Some US scientists resigned their jobs rather than give in to White House pressure to underreport global warming. In the absence of substantial federal action, state governments have adopted emissions-control laws such as the Regional Greenhouse Gas Initiative in the Northeast and the Global Warming Solutions Act of 2006 in California. In 2019 a new climate change bill was introduced in Minnesota. One of the targets, is making all the energy of the state carbon free, by 2030. In order to reconcile economic development with mitigating carbon emissions, developing countries need particular support, both financial and technical. One of the means of achieving this is the Kyoto Protocol's Clean Development Mechanism (CDM). The World Bank's Prototype Carbon Fund is a public private partnership that operates within the CDM. Increase in climate finance not connected to ODA. The main point being that there is a conflict between the OECD states budget deficit cuts, the need to help developing countries adapt to develop sustainably and the need to ensure that funding does not come from cutting aid to other important Millennium Development Goals. However, none of these initiatives suggest a quantitative cap on the emissions from developing countries. This is considered as a particularly difficult policy proposal as the economic growth of developing countries are proportionally reflected in the growth of greenhouse emissions. Critics[who?] of mitigation often argue that, the developing countries' drive to attain a comparable living standard to the developed countries would doom the attempt at mitigation of global warming. Critics[who?] also argue that holding down emissions would shift the human cost of global warming from a general one to one that was borne most heavily by the poorest populations on the planet. In an attempt to provide more opportunities for developing countries to adapt clean technologies, UNEP and WTO urged the international community to reduce trade barriers and to conclude the Doha trade round "which includes opening trade in environmental goods and services". While many of the proposed methods of mitigating global warming require governmental funding, legislation and regulatory action, individuals and businesses can also play a part in the mitigation effort. Environmental groups encourage individual action against global warming, often aimed at the consumer. Common recommendations include lowering home heating and cooling usage, burning less gasoline, supporting renewable energy sources, buying local products to reduce transportation, turning off unused devices, and various others. A geophysicist at Utrecht University has urged similar institutions to hold the vanguard in voluntary mitigation, suggesting the use of communications technologies such as videoconferencing to reduce their dependence on long-haul flights. In 2008, climate scientist Kevin Anderson raised concern about the growing effect of rapidly increasing global air transport on the climate in a paper, and a presentation, suggesting that reversing this trend is necessary to reduce emissions. Part of the difficulty is that when aviation emissions are made at high altitude, the climate impacts are much greater than otherwise. Others have been raising the related concerns of the increasing hypermobility of individuals, whether traveling for business or pleasure, involving frequent and often long distance air travel, as well as air shipment of goods. On 9 May 2005 Jeff Immelt, the chief executive of General Electric (GE), announced plans to reduce GE's global warming related emissions by one percent by 2012. "GE said that given its projected growth, those emissions would have risen by 40 percent without such action." On 21 June 2005 a group of leading airlines, airports, and aerospace manufacturers pledged to work together to reduce the negative environmental impact of aviation, including limiting the impact of air travel on climate change by improving fuel efficiency and reducing carbon dioxide emissions of new aircraft by fifty percent per seat kilometre by 2020 from 2000 levels. The group aims to develop a common reporting system for carbon dioxide emissions per aircraft by the end of 2005, and pressed for the early inclusion of aviation in the European Union's carbon emission trading scheme. Climate change is also a concern for large institutional investors who have a long term time horizon and potentially large exposure to the negative impacts of global warming because of the large geographic footprint of their multi-national holdings. SRI (Socially responsible investing) Funds allow investors to invest in funds that meet high ESG (environmental, social, governance) standards as such funds invest in companies that are aligned with these goals. Proxy firms can be used to draft guidelines for investment managers that take these concerns into account. In some countries, those affected by climate change may be able to sue major producers. Attempts at litigation have been initiated by entire peoples such as Palau and the Inuit, as well as non-governmental organizations such as the Sierra Club. Although proving that particular weather events are due specifically to global warming may never be possible, methodologies have been developed to show the increased risk of such events caused by global warming. For a legal action for negligence (or similar) to succeed, "Plaintiffs ... must show that, more probably than not, their individual injuries were caused by the risk factor in question, as opposed to any other cause. This has sometimes been translated to a requirement of a relative risk of at least two." Another route (though with little legal bite) is the World Heritage Convention, if it can be shown that climate change is affecting World Heritage Sites like Mount Everest. Besides countries suing one another, there are also cases where people in a country have taken legal steps against their own government. Legal action for instance has been taken to try to force the US Environmental Protection Agency to regulate greenhouse gas emissions under the Clean Air Act, and against the Export-Import Bank and OPIC for failing to assess environmental impacts (including global warming impacts) under NEPA. In the Netherlands and Belgium, organisations such as Urgenda and the vzw Klimaatzaak in Belgium have also sued their governments as they believe their governments aren't meeting the emission reductions they agreed to. Urgenda have already won their case against the Dutch government. According to a 2004 study commissioned by Friends of the Earth, ExxonMobil, and its predecessors caused 4.7 to 5.3 percent of the world's man-made carbon dioxide emissions between 1882 and 2002. The group suggested that such studies could form the basis for eventual legal action. In 2015, Exxon received a subpoena. According to the Washington Post and confirmed by the company, the attorney general of New York, Eric Schneiderman, opened an investigation into the possibility that the company had misled the public and investors about the risks of climate change. ^ Marland, G., T.A. Boden, and R. J. Andres. 2007. Global, Regional, and National CO2 Emissions. In Trends: A Compendium of Data on Global Change. Carbon Dioxide Information Analysis Center, Oak Ridge National Laboratory, United States Department of Energy, Oak Ridge, Tenn., US. ^ UNFCCC. Conference of the Parties (COP) (15 March 2011), Report of the Conference of the Parties on its sixteenth session, held in Cancun from 29 November to 10 December 2010. Addendum. Part two: Action taken by the Conference of the Parties at its sixteenth session (PDF), Geneva, Switzerland: United Nations , p. 3, paragraph 4. Document available in UN languages and text format. ^ Sutter, John D.; Berlinger, Joshua (12 December 2015). "Final draft of climate deal formally accepted in Paris". CNN. Cable News Network, Turner Broadcasting System, Inc. Retrieved 12 December 2015. ^ "One Earth Climate Model". One Earth Climate Model. University of Technology, Climate and Energy College, German Aerospace Center. Retrieved 22 January 2019. ^ Chow, Lorraine (21 January 2019). "DiCaprio-Funded Study: Staying Below 1.5ºC is Totally Possible". Ecowatch. Retrieved 22 January 2019. ^ U.S. Climate Change Science Program and the Subcommittee on Global Change Research (January 2009). Granger Morgan; H. Dowlatabadi; M. Henrion; D. Keith; R. Lempert; S. McBride; M. Small; T. Wilbanks, eds. "Best practice approaches for characterizing, communicating, and incorporating scientific uncertainty in decisionmaking". National Oceanic and Atmospheric Administration, Washington D.C., USA. pp. 10–11. Archived from the original on 2010-05-27. Retrieved 2010-06-07. ^ Sterman, J.D. ; L.B. Sweeney (2007). "Understanding public complacency about climate change: adults' mental models of climate change violate conservation of matter" (PDF). Climatic Change. 80 (3–4): 221–22. doi:10.1007/s10584-006-9107-5. Retrieved 2011-05-10. ^ Anderson, Kevin; Bows, Alice (13 January 2011). "Beyond 'dangerous' climate change: emission scenarios for a new world". Philosophical Transactions of the Royal Society A. 369 (1934): 20–44. Bibcode:2011RSPTA.369...20A. doi:10.1098/rsta.2010.0290. PMID 21115511. ^ Anderson, Kevin; Bows, Alice (2012). "A new paradigm for climate change". Nature Climate Change. 2 (9): 639–40. Bibcode:2012NatCC...2..639A. doi:10.1038/nclimate1646. ^ The Radical Emission Reduction Conference: 10–11 December 2013 Archived 27 October 2014 at the Wayback Machine, sponsored by the Tyndall Centre. Video proceedings Archived 2017-03-24 at the Wayback Machine on-line. ^ Steffen, Will; Rockström, Johan; Richardson, Katherine; M. Lenton, Timothy; Folke, Carl; Liverman, Diana; P. Summerhayes, Colin; D. Barnosky, Anthony; E. Cornell, Sarah; Crucifix, Michel; F. Donges, Jonathan; Fetzer, Ingo; J. Lade, Steven; Scheffer, Marten; Winkelmann, Ricarda; Hans Joachim Schellnhuber, Hans (August 6, 2018). "Trajectories of the Earth System in the Anthropocene". Proceedings of the National Academy of Sciences. Retrieved 21 August 2018. ^ Issues in Science Archived 2013-09-27 at the Wayback Machine & Technology Online; "Promoting Low-Carbon Electricity Production"
^ "Impacts assessment of plug-in hybrid vehicles on electric utilities and regional u.s. power grids" (PDF). Pacific Northwest National Laboratory. 2010. ^ Pacala, Stephen; Socolow, Robert H. (2004). "Stabilization Wedges: Solving the Climate Problem for the Next 50 Years with Current Technologies" (PDF). Science. 305 (5686): 968–72. Bibcode:2004Sci...305..968P. CiteSeerX 10.1.1.642.8472. doi:10.1126/science.1100103. PMID 15310891. Archived from the original (PDF) on 2007-10-24. Retrieved 2007-10-24. ^ Romm, Joe (19 June 2008). "Cleaning up on carbon". Nature Reports Climate Change. Retrieved 2 January 2013. ^ Edenhofer, Ottmar; Pichs-Madruga, Ramón; et al. (2014). "Summary for Policymakers" (PDF). In IPCC. Climate change 2014: mitigation of climate change. Contribution of Working Group III to the Fifth Assessment Report of the Intergovernmental Panel on Climate Change. Cambridge, UK and New York, NY, USA: Cambridge University Press. ISBN 978-1-107-65481-5. Retrieved 2016-06-21. ^ a b c d Wynes, Seth; Nicholas, Kimberly A (12 July 2017). "The climate mitigation gap: education and government recommendations miss the most effective individual actions". Environmental Research Letters. 12 (7): 074024. Bibcode:2017ERL....12g4024W. doi:10.1088/1748-9326/aa7541. ^ a b c Ceballos, Gerardo; Ehrlich, Paul P; Dirzo, Rodolfo (23 May 2017). "Biological annihilation via the ongoing sixth mass extinction signaled by vertebrate population losses and declines". Proceedings of the National Academy of Sciences of the United States of America. 114 (30): E6089–E6096. doi:10.1073/pnas.1704949114. PMC 5544311. PMID 28696295. Much less frequently mentioned are, however, the ultimate drivers of those immediate causes of biotic destruction, namely, human overpopulation and continued population growth, and overconsumption, especially by the rich. These drivers, all of which trace to the fiction that perpetual growth can occur on a finite planet, are themselves increasing rapidly. ^ a b c Pimm, S. L.; Jenkins, C. N.; Abell, R.; Brooks, T. M.; Gittleman, J. L.; Joppa, L. N.; Raven, P. H.; Roberts, C. M.; Sexton, J. O. (30 May 2014). "The biodiversity of species and their rates of extinction, distribution, and protection" (PDF). Science. 344 (6187): 1246752. doi:10.1126/science.1246752. PMID 24876501. Retrieved 15 December 2016. The overarching driver of species extinction is human population growth and increasing per capita consumption. ^ Fleurbaey, Marc; Kartha, Sivan; et al. (2014). "Chapter 4: Sustainable Development and Equity" (PDF). In IPCC. Climate change 2014: mitigation of climate change. Contribution of Working Group III to the Fifth Assessment Report of the Intergovernmental Panel on Climate Change. Cambridge, UK and New York, NY, USA: Cambridge University Press. ISBN 978-1-107-65481-5. Retrieved 2016-06-21. ^ Scarborough, Peter; Appleby, Paul N.; Mizdrak, Anja; Briggs, Adam D.M. ; Travis, Ruth C.; Bradbury, Kathryn E.; Key, Timothy J. (July 2014). "Dietary greenhouse gas emissions of meat-eaters, fish-eaters, vegetarians and vegans in the UK". Climatic Change. 125 (2): 179–92. doi:10.1007/s10584-014-1169-1. PMC 4372775. PMID 25834298. ^ Harvey, Fiona (21 March 2016). "Eat less meat to avoid dangerous global warming, scientists say". The Guardian. Retrieved 2016-06-20. ^ Milman, Oliver (20 June 2016). "China's plan to cut meat consumption by 50% cheered by climate campaigners". The Guardian. Retrieved 2016-06-20. ^ Carrington, Damian (7 November 2016). "Tax meat and dairy to cut emissions and save lives, study urges". The Guardian. London, United Kingdom. ISSN 0261-3077. Retrieved 2016-11-07. ^ Springmann, Marco; Mason-D'Croz, Daniel; Robinson, Sherman; Wiebe, Keith; Godfray, H Charles J; Rayner, Mike; Scarborough, Peter (7 November 2016). "Mitigation potential and global health impacts from emissions pricing of food commodities". Nature Climate Change. 7 (1): 69. Bibcode:2017NatCC...7...69S. doi:10.1038/nclimate3155. ISSN 1758-678X. ^ Diesendorf, Mark (2007). Greenhouse Solutions with Sustainable Energy, UNSW Press, p. 86. ^ "Loading Order White Paper" (PDF). Retrieved 2010-07-16. ^ Diesendorf, Mark (2007). Greenhouse Solutions with Sustainable Energy, UNSW Press, p. 87. ^ Sophie Hebden (2006-06-22). "Invest in clean technology says IEA report". Scidev.net. Retrieved 2010-07-16. ^ "Climate Change". California Air Resources Board. Retrieved 2015-04-29. ^ "Roadmap for moving to a low-carbon economy in 2050 – European Commission". Archived from the original on 2015-05-11. Retrieved 2015-04-29. ^ Wei, Max; Nelson, James H; Greenblatt, Jeffery B; Mileva, Ana; Johnston, Josiah; Ting, Michael; Yang, Christopher; Jones, Chris; McMahon, James E; Kammen, Daniel M (2013-03-01). "Deep carbon reductions in California require electrification and integration across economic sectors". Environmental Research Letters. 8 (1): 014038. Bibcode:2013ERL.....8a4038W. doi:10.1088/1748-9326/8/1/014038. ISSN 1748-9326. Retrieved 2015-03-21. ^ Williams, James H. (2012). "The technology path to deep greenhouse gas emissions cuts by 2050: The pivotal role of electricity" (PDF). Science. 335 (6064): 53–9. Bibcode:2012Sci...335...53W. doi:10.1126/science.1208365. PMID 22116030. Retrieved 2015-03-21. ^ "Natural Gas and the Environment". Naturalgas.org. Archived from the original on 2009-05-03. Retrieved 2011-02-06. ^ "Annual Energy Outlook 2015 – Energy Information Administration". Eia.gov. 2015-04-14. Retrieved 2016-05-06. ^ IEA Renewable Energy Working Party (2002). Renewable Energy... into the mainstream, p. 9. ^ HM Treasury (2006). Stern Review on the Economics of Climate Change. ^ International Energy Agency. IEA urges governments to adopt effective policies based on key design principles to accelerate the exploitation of the large potential for renewable energy 29 September 2008. ^ REN21 (2006). Changing climates: The Role of Renewable Energy in a Carbon-constrained World (PDF) Archived 2007-06-11 at the Wayback Machine p. 2. ^ New UN report points to power of renewable energy to mitigate carbon emissions UN News Centre, 8 December 2007. ^ Joel Makower, Ron Pernick, and Clint Wilder (2008). Clean Energy Trends 2008, Clean Edge, p. 2. ^ United Nations Environment Programme and New Energy Finance Ltd. (2007). Global Trends in Sustainable Energy Investment 2007: Analysis of Trends and Issues in the Financing of Renewable Energy and Energy Efficiency in OECD and Developing Countries (PDF) Archived 2009-03-25 at the Wayback Machine p. 3. ^ REN21 (2010). Renewables 2010 Global Status Report Archived 2012-05-13 at the Wayback Machine p. 15. ^ "Conclusion". Worldwide electricity production from renewable energy sources. Paris: Observ'ER. 2012. Retrieved 28 March 2013. ^ a b Paul Gipe (4 April 2013). "100 Percent Renewable Vision Building". Renewable Energy World. ^ IPCC (2011). "Special Report on Renewable Energy Sources and Climate Change Mitigation" (PDF). Cambridge University Press, Cambridge, United Kingdom and New York, NY. p. 17. Archived from the original (PDF) on 2014-01-11. ^ International Renewable Energy Agency (2012). "Renewable Power Generation Costs in 2012: An Overview" (PDF). ^ Donald W. Aitken. Transitioning to a Renewable Energy Future, International Solar Energy Society, January 2010, p. 3. ^ REN21 (2012). Renewables Global Status Report 2012 Archived December 15, 2012, at the Wayback Machine p. 17. ^ REN21 (2011). "Renewables 2011: Global Status Report" (PDF). pp. 11–13. Archived from the original (PDF) on 2011-09-05. ^ Top of the list, Renewable Energy World, 2 January 2006. ^ Keith Johnson, Wind Shear: GE Wins, Vestas Loses in Wind-Power Market Race, Wall Street Journal, March 25th 2009, accessed on January 7th 2010. ^ Mark A. Delucchi; Mark Z. Jacobson (2011). "Providing all global energy with wind, water, and solar power, Part II: Reliability, system and transmission costs, and policies" (PDF). Energy Policy. Elsevier Ltd. pp. 1170–90. ^ Ben Sills (August 29, 2011). "Solar May Produce Most of World's Power by 2060, IEA Says". Bloomberg. ^ Smil, Vaclav (2012). "A Skeptic Looks at Alternative Energy". Spectrum magazine. IEEE. Retrieved 28 March 2013. ^ "Japan's nuclear disaster boosts renewables". UPI.com. March 21, 2011. ^ John Vidall (15 March 2011). "Japan nuclear crisis prompts surging investor confidence in renewables". The Guardian. London. ^ REN21 (2010). Renewables 2010 Global Status Report Archived April 16, 2012, at the Wayback Machine pp. 9, 34. ^ a b c REN21 (2010). Renewables 2010 Global Status Report Archived 2012-05-13 at the Wayback Machine p. 53. ^ "The Nuclear Renaissance – World Nuclear Association". ^ "NEWS ANALYSIS: Japan crisis puts global nuclear expansion in doubt". Platts. 21 March 2011. ^ WNA (20 June 2013). "Nuclear power down in 2012". World Nuclear News. ^ Kharecha, Pushker A.; Hansen, James E. (7 May 2013). "Prevented Mortality and Greenhouse Gas Emissions from Historical and Projected Nuclear Power". Environ. Sci. Technol. 47 (9): 4889–95. Bibcode:2013EnST...47.4889K. doi:10.1021/es3051197. PMID 23495839. ^ a b Brian Martin. Opposing nuclear power: past and present, Social Alternatives, Vol. 26, No. 2, Second Quarter 2007, pp. 43–47. ^ M.V. Ramana (July 2011). "Nuclear power and the public". Bulletin of the Atomic Scientists. p. 44. ^ Mark Cooper (July 2011). "The implications of Fukushima: The US perspective". Bulletin of the Atomic Scientists. p. 9. ^ "Radioactive Waste Management – Nuclear Waste Disposal". World Nuclear Association. 2016. A typical 1000 MWe light water reactor will generate (directly and indirectly) 200–350 m3 low- and intermediate-level waste per year. It will also discharge about 20 m3 (27 tonnes) of used fuel per year, which corresponds to a 75 m3 disposal volume following encapsulation if it is treated as waste. Where that used fuel is reprocessed, only 3 m3 of vitrified waste (glass) is produced, which is equivalent to a 28 m3 disposal volume following placement in a disposal canister. ^ Choi, Hangbok; Baxter, Alan (1 May 2010). "A comparative study on recycling spent fuels in gas-cooled fast reactors". Annals of Nuclear Energy. 37 (5): 723–729. doi:10.1016/j.anucene.2010.01.014. ^ "Publication: Key World Energy Statistics 2016" (PDF). p. 25. ^ "World Power Reactors". Archived from the original on March 3, 2008. Retrieved 2016-05-06. ^ a b c Warner, E. S.; Heath, G. A. (2012). "Life Cycle Greenhouse Gas Emissions of Nuclear Electricity Generation". Journal of Industrial Ecology. 16: S73. doi:10.1111/j.1530-9290.2012.00472.x. ^ "IPCC Working Group III – Mitigation of Climate Change, Annex II I: Technology – specific cost and performance parameters" (PDF). IPCC. 2014. p. 10. Archived from the original (PDF) on 16 June 2014. Retrieved 1 August 2014. ^ Qvist, Staffan A.; Brook, Barry W. (13 May 2015). "Potential for Worldwide Displacement of Fossil-Fuel Electricity by Nuclear Energy in Three Decades Based on Extrapolation of Regional Deployment Data". PLoS ONE. 10 (5): e0124074. Bibcode:2015PLoSO..1024074Q. doi:10.1371/journal.pone.0124074. PMC 4429979. PMID 25970621. ^ a b c Brook, Barry W. (1 March 2012). "Could nuclear fission energy, etc., solve the greenhouse problem? The affirmative case". Energy Policy. 42: 4–8. doi:10.1016/j.enpol.2011.11.041. ^ a b c Loftus, Peter J.; Cohen, Armond M.; Long, Jane C. S.; Jenkins, Jesse D. (1 January 2015). "A critical review of global decarbonization scenarios: what do they tell us about feasibility?". WIREs Clim Change. 6 (1): 93–112. doi:10.1002/wcc.324. ^ Trevor Findlay. The Future of Nuclear Energy to 2030 and its Implications for Safety, Security and Nonproliferation Archived 2011-06-16 at the Wayback Machine February 4, 2010. ^ Trevor Findlay (2010). The Future of Nuclear Energy to 2030 and its Implications for Safety, Security and Nonproliferation: Overview Archived 2013-05-12 at the Wayback Machine, The Centre for International Governance Innovation (CIGI), Waterloo, Ontario, Canada, pp. 10–11. ^ M.V. Ramana. Nuclear Power: Economic, Safety, Health, and Environmental Issues of Near-Term Technologies, Annual Review of Environment and Resources, 2009, 34, pp. 144–45. ^ International Energy Agency, World Energy Outlook, 2009, p. 160. ^ James Kanter. In Finland, Nuclear Renaissance Runs Into Trouble New York Times, May 28, 2009. ^ James Kanter. Is the Nuclear Renaissance Fizzling? Green, 29 May 2009. ^ Rob Broomby. Nuclear dawn delayed in Finland BBC News, 8 July 2009. ^ "China Builds Nuclear Reactor for 40% Less Than Cost in France, Areva Says". Bloomberg. ^ "PRIS – Home". Iaea.org. Retrieved 2016-05-06. ^ a b "Nuclear Power in the USA". World Nuclear Association. June 2008. Retrieved 2008-07-25. ^ Matthew L. Wald (December 7, 2010). Nuclear 'Renaissance' Is Short on Largess The New York Times. ^ Michael Dittmar. Taking stock of nuclear renaissance that never was Sydney Morning Herald, August 18, 2010. ^ "UK popular support for nuclear power rises -poll". Reuters. 2 July 2016. ^ Annika Breidthardt (May 30, 2011). "German government wants nuclear exit by 2022 at latest". Reuters. ^ Stewart, C. L.; Stacey, W. M. (1 July 2014). "The SABrR Concept for A Fission-Fusion Hybrid 238U-to-239Pu Fissile Production Reactor". NT. 187 (1): 1. doi:10.13182/NT13-102. ^ "Climate Control: a proposal for controlling global greenhouse gas emissions" (PDF). Sustento Institute. Archived from the original (PDF) on 2008-02-16. Retrieved 2007-12-10. ^ Hackney, Thomas (July 2009). "#7: Moratorium on New Projects for Fossil Fuel Production & Declining Cap on Existing Production" (PDF). BCSEA's Climate Action Portfolio. BC Sustainable Energy Association. Retrieved 2008-04-24. ^ Alvarez, R. A; Pacala, S. W; Winebrake, J. J; Chameides, W. L; Hamburg, S. P (2012). "Greater focus needed on methane leakage from natural gas infrastructure". Proceedings of the National Academy of Sciences. 109 (17): 6435–40. Bibcode:2012PNAS..109.6435A. doi:10.1073/pnas.1202407109. PMC 3340093. PMID 22493226. Retrieved 2016-05-06. ^ Brandt, A. R.; Heath, G. A.; Kort, E. A.; O'Sullivan, F.; Pétron, G.; Jordaan, S. M.; Tans, P.; Wilcox, J.; Gopstein, A. M.; Arent, D.; others (2014). "Methane leaks from North American natural gas systems" (PDF). Science. 343 (6172): 733–35. Bibcode:2014Sci...343..733B. doi:10.1126/science.1247045. PMID 24531957. Archived from the original (PDF) on 2015-08-07. Retrieved 2015-04-29. ^ Staffell Iain; et al. (2012). "A review of domestic heat pumps". Energy and Environmental Science. 5 (11): 9291–9306. doi:10.1039/c2ee22653g. ^ Carvalho; et al. (2015). "Ground source heat pump carbon emissions and primary energy reduction potential for heating in buildings in Europe—results of a case study in Portugal". Renewable and Sustainable Energy Reviews. 45: 755–768. doi:10.1016/j.rser.2015.02.034. ^ Sternberg André, Bardow André (2015). "Power-to-What? – Environmental assessment of energy storage systems". Energy and Environmental Science. 8 (2): 389–400. doi:10.1039/c4ee03051f. ^ Dodge, Edward (December 6, 2014). "Power-to-Gas Enables Massive Energy Storage". TheEnergyCollective.com. Retrieved 25 May 2015. ^ Ground, Lukas; Schulze, Paula; Holstein, Johan (June 20, 2013). Systems Analysis Power to Gas (PDF). Groningen: DNV, KEMA Nederland B.V. Archived from the original (PDF) on January 24, 2015. Retrieved 25 May 2015. ^ "Shell Pearl GTL – Andy Brown" Royal Dutch Shell Company video, March 18, 2011. ^ Scott, Mark (October 7, 2014). "Energy for a Rainy Day, or a Windless One". New York Times. Retrieved 26 May 2015. ^ Randall, Tom (January 30, 2015). "Seven Reasons Cheap Oil Can't Stop Renewables Now". BloombergBusiness. Bloomberg L.P. Retrieved 26 May 2015. ^ "Home – 5th Conference on Carbon Dioxide as Feedstock for Fuels, Chemistry and Polymers". Co2-chemistry.eu. 2008-12-01. Retrieved 2016-05-06. ^ "OECD Environmental Outlook to 2050, Climate Change Chapter, pre-release version" (PDF). OECD. 2011. Retrieved 2012-04-23. ^ "IEA Technology Roadmap Carbon Capture and Storage 2009" (PDF). OECD/IEA. 2009. Archived from the original (PDF) on 2010-12-04. Retrieved 2012-04-23. ^ "Geoengineering the climate: science, governance and uncertainty". The Royal Society. 2009. Retrieved 2012-04-23. ^ Hare, B.; Meinshausen, M. (2006). "How Much Warming are We Committed to and How Much can be Avoided?". Climatic Change. 75 (1–2): 111–49. doi:10.1007/s10584-005-9027-9. ^ Azar, C., Lindgren, K., Larson, E.D. and Möllersten, K.: (2006)"Carbon capture and storage from fossil fuels and biomass – Costs and potential role in stabilising the atmosphere", Climatic Change, 74, 47–79. ^ "OECD Environmental Outlook to 2050, Climate Change Chapter, pre-release version" (PDF). OECD. 2011. Retrieved 2012-01-16. ^ a b "India should follow China to find a way out of the woods on saving forest people". The Guardian. 22 July 2016. Retrieved 2 November 2016. ^ a b "How Conservation Became Colonialism". Foreign Policy. 16 July 2018. Retrieved 30 July 2018. ^ "China's forest tenure reforms". rightsandresources.org. Retrieved 7 August 2016. ^ Ding, Helen; Veit, Peter; Gray, Erin; Reytar, Katie; Altamirano, Juan-Carlos; Blackman, Allen; Hodgdon, Benjamin (October 2016). "Climate benefits, tenure costs: The economic case for securing indigenous land rights in the Amazon". World Resources Institute (WRI). Washington DC, USA. Retrieved 2016-11-02. ^ Ding, Helen; Veit, Peter G; Blackman, Allen; Gray, Erin; Reytar, Katie; Altamirano, Juan-Carlos; Hodgdon, Benjamin (2016). Climate benefits, tenure costs: The economic case for securing indigenous land rights in the Amazon (PDF). Washington DC, USA: World Resources Institute (WRI). ISBN 978-1-56973-894-8. Retrieved 2016-11-02. ^ "Rights not 'fortress conservation' key to save planet, says UN expert". The Guardian. 16 July 2018. Retrieved 25 August 2018. ^ "New Jungles Prompt a Debate on Rain Forests". New York Times. 29 January 2009. Retrieved 18 July 2016. ^ "In Latin America, Forests May Rise to Challenge of Carbon Dioxide". New York Times. 16 May 2016. Retrieved 18 July 2016. ^ a b "How cows could repair the world". nationalgeographic.com. March 6, 2013. Retrieved May 5, 2013. ^ a b c d "How fences could save the planet". newstatesman.com. January 13, 2011. Retrieved May 5, 2013. ^ "Restoring soil carbon can reverse global warming, desertification and biodiversity". mongabay.com. February 21, 2008. Archived from the original on June 25, 2013. Retrieved May 5, 2013. ^ "How eating grass-fed beef could help fight climate change". time.com. January 25, 2010. Retrieved May 11, 2013. ^ P. Falkowski; et al. (13 October 2000). "The Global Carbon Cycle: A Test of Our Knowledge of Earth as a System". Science. 290 (5490): 291–6. doi:10.1126/science.290.5490.291. PMID 11030643. Retrieved 4 February 2015. ^ a b "CO2 turned into stone in Iceland in climate change breakthrough". The Guardian. 9 June 2016. Retrieved 2 September 2017. ^ a b c Robinson, Simon (2010-01-22). "How to Reduce Carbon Emissions: Capture and Store it?". Time.com. Retrieved 2010-08-26. ^ "Global Status of CCS Report:2011". Global CCS Institute. Retrieved 2011-12-14. ^ Drajem, Mark (April 14, 2014). "Coal's Best Hope Rising With Costliest U.S. Power Plant". Bloomberg Business. ^ Barker, T.; et al. (2007). 11.2.2 Ocean fertilization and other geo-engineering options. In (book chapter): Mitigation from a cross-sectoral perspective. In: Climate Change 2007: Mitigation. Contribution of Working Group III to the Fourth Assessment Report of the Intergovernmental Panel on Climate Change (B. Metz et al. (eds.)). Print version: Cambridge University Press, Cambridge, UK, and New York, NY, US. This version: IPCC website. ISBN 978-0-521-88011-4. Retrieved 2010-04-05. ^ IPCC (2007). C. Mitigation in the short and medium term (until 2030). In (book section): Summary for Policymakers. In: Climate Change 2007: Mitigation. Contribution of Working Group III to the Fourth Assessment Report of the Intergovernmental Panel on Climate Change (B. Metz et al. (eds.)). Print version: Cambridge University Press, Cambridge, UK, and New York, NY, US. This version: IPCC website. ISBN 978-0-521-88011-4. Retrieved 2010-05-15. ^ The Royal Society, (2009) "Geoengineering the climate: science, governance and uncertainty". Retrieved 2009-09-12. ^ "MIT Energy Research Council: Research Spotlight". Web.mit.edu. Retrieved 2010-08-26. ^ "GreenFuel Technologies Closing Down: Greentech Media". Greentechmedia.com. 2009-05-13. Retrieved 2010-08-26. ^ Launder B.; J.M.T. Thompson (2008). "Global and Arctic climate engineering: numerical model studies". Phil. Trans. R. Soc. A. 366 (1882): 4039–4056. Bibcode:2008RSPTA.366.4039C. doi:10.1098/rsta.2008.0132. PMID 18757275. ^ Shindell, Drew (2012-01-13). "Simultaneously Mitigating Near-Term Climate Change and Improving Human Health and Food Security | Science". Sciencemag.org. Retrieved 2016-05-06. ^ Grubb, M. (July–September 2003). "The Economics of the Kyoto Protocol" (PDF). World Economics. 4 (3): 146–47. Archived from the original (PDF) on 2011-07-17. Retrieved 2010-03-25. ^ "Methane vs. Carbon Dioxide: A Greenhouse Gas Showdown". One Green Planet. Retrieved 2015-11-15. ^ Albrittion, D.L. ; et al. (2001). "Halocarbons and related compounds". In J.T. Houghton; et al. Technical summary. Climate Change 2001: The physical science basis. Contribution of Working Group I to the Third Assessment Report of the Intergovernmental Panel on Climate Change. Print version: Cambridge University Press, Cambridge, United Kingdom and New York, NY, USA. This version: GRID-Arendal website. p. 43. Retrieved 2011-06-07. ^ Velders, G.J.M. ; et al. (20 March 2007). "The importance of the Montreal Protocol in protecting climate". PNAS. 104 (12): 4814–19. Bibcode:2007PNAS..104.4814V. doi:10.1073/pnas.0610328104. PMC 1817831. PMID 17360370. Retrieved 2011-06-07. ^ "The Future of the Canals" (PDF). London Canal Museum. Retrieved 8 September 2013. ^ Lowe, Marcia D. (April 1994). "Back on Track: The Global Rail Revival". Retrieved 2007-02-15. ^ Schwartzman, Peter. "TRUCKS VS. TRAINS—WHO WINS?". Retrieved 2007-02-15. ^ Fulton, William; Pendall, Rolf; Nguyen, Mai; Harrison, Alicia (2001). "Who Sprawls Most? How Growth Patterns Differ Across the U.S" (PDF). Survey Series. Washington D.C.: The Brookings Institution Center on Urban and Metropolitan Policy. ^ "Energy Saving Trust: Home and the environment". Energy Saving Trust. Retrieved 2010-08-26. ^ Osborne, Hilary (2005-08-02). "Energy efficiency 'saves £350m a year'". Guardian Unlimited. London. ^ Fetcher, Ned (December 2009). "Effects of climate and institution size on greenhouse gas emissions from colleges and universities in the United States". Sustainability: The Journal of Record. 2 (6): 362–67. doi:10.1089/SUS.2009.9820. ^ "Greenhouse Gas Emissions of Colleges and Universities". Archived from the original on 2011-01-06. Retrieved 2 March 2011. ^ Rosenfeld, Arthur H.; Romm, Joseph J.; Akbari, Hashem; Lloyd, Alan C. (February–March 1997). "Technology Review". Painting the Town White – and Green. Massachusetts Institute of Technology. Archived from the original on 2005-11-08. Retrieved 2005-11-21. ^ Committee on Science, Engineering; Public Policy (1992). Policy Implications of Greenhouse Warming: Mitigation, Adaptation, and the Science Base. Washington, D.C.: National Academy Press. ISBN 978-0-309-04386-1. ^ "Agriculture: Sources of Greenhouse Gas Emissions". EPA. 2015. ^ Susan S. Lang (13 July 2005). "Organic farming produces same corn and soybean yields as conventional farms, but consumes less energy and no pesticides, study finds". Retrieved 8 July 2008. ^ Pimentel, David; Hepperly, Paul; Hanson, James; Douds, David; Seidel, Rita (2005). "Environmental, Energetic, and Economic Comparisons of Organic and Conventional Farming Systems". BioScience. 55 (7): 573–82. doi:10.1641/0006-3568(2005)055[0573:EEAECO]2.0.CO;2. ^ Lal, Rattan; Griffin, Michael; Apt, Jay; Lave, Lester; Morgan, M. Granger (2004). "Ecology: Managing Soil Carbon". Science. 304 (5669): 393. doi:10.1126/science.1093079. PMID 15087532. ^ A. N. (Thanos) Papanicolaou; Kenneth M. Wacha; Benjamin K. Abban; Christopher G. Wilson; Jerry L. Hatfield; Charles O. Stanier; Timothy R. Filley (2015). "Conservation Farming Shown to Protect Carbon in Soil". Journal of Geophysical Research: Biogeosciences. 120 (11): 2375–2401. Bibcode:2015JGRG..120.2375P. doi:10.1002/2015JG003078. ^ "Cover Crops, a Farming Revolution With Deep Roots in the Past". The New York Times. 2016. ^ Lugato, Emanuele; Panagos, Panos; Bampa, Francesca; Jones, Arwyn; Montanarella, Luca (2014-01-01). "A new baseline of organic carbon stock in European agricultural soils using a modelling approach". Global Change Biology. 20 (1): 313–326. Bibcode:2014GCBio..20..313L. doi:10.1111/gcb.12292. ISSN 1365-2486. PMID 23765562. ^ Lugato, Emanuele; Bampa, Francesca; Panagos, Panos; Montanarella, Luca; Jones, Arwyn (2014-11-01). "Potential carbon sequestration of European arable soils estimated by modelling a comprehensive set of management practices". Global Change Biology. 20 (11): 3557–3567. Bibcode:2014GCBio..20.3557L. doi:10.1111/gcb.12551. ISSN 1365-2486. PMID 24789378. ^ Jowit, Juliette; Wintour, Patrick (26 June 2008). "Cost of tackling global climate change has doubled, warns Stern". The Guardian. London. ^ "CIA World Factbook". US CIA. 18 Oct 2011. Retrieved 21 Oct 2011. ^ Yohe, G.W. ; et al. (2007). Executive summary. In (book chapter): Perspectives on climate change and sustainability. In: Climate Change 2007: Impacts, Adaptation and Vulnerability. Contribution of Working Group II to the Fourth Assessment Report of the Intergovernmental Panel on Climate Change (M.L. Parry et al., (eds.)). Print version: Cambridge University Press, Cambridge, UK, and New York, NY, US. Web version: IPCC website. ISBN 978-0-521-88010-7. Archived from the original on 2010-05-02. Retrieved 2010-05-15. ^ Toth, F.L. ; et al. (2001). 10.4.7 Emerging Conclusions with Respect to Policy-relevant Scientific Questions. In (book chapter): Decision-making Frameworks. In: Climate Change 2001: Mitigation. Contribution of Working Group III to the Third Assessment Report of the Intergovernmental Panel on Climate Change (B. Metz et al. Eds.). Print version: Cambridge University Press, Cambridge, UK, and New York, NY, US. This version: GRID-Arendal website. ISBN 978-0-521-01502-8. Archived from the original on 2009-08-05. Retrieved 2010-01-10. ^ Rogner, H.-H.; et al. (2007). Executive Summary. In (book chapter): Introduction. In: Climate Change 2007: Mitigation. Contribution of Working Group III to the Fourth Assessment Report of the Intergovernmental Panel on Climate Change (B. Metz et al. (eds)). Print version: Cambridge University Press, Cambridge, United Kingdom and New York, NY. Web version: IPCC website. ISBN 978-0-521-88011-4. Retrieved 2010-05-05. ^ a b c Banuri, T.; et al. (1996). Equity and Social Considerations. In: Climate Change 1995: Economic and Social Dimensions of Climate Change. Contribution of Working Group III to the Second Assessment Report of the Intergovernmental Panel on Climate Change (J.P. Bruce et al. Eds.) (PDF). This version: Printed by Cambridge University Press, Cambridge, UK, and New York, NY, US. PDF version: IPCC website. doi:10.2277/0521568544. ISBN 978-0-521-56854-8. ^ a b Goldemberg, J.; et al. (1996). Introduction: scope of the assessment. In: Climate Change 1995: Economic and Social Dimensions of Climate Change. Contribution of Working Group III to the Second Assessment Report of the Intergovernmental Panel on Climate Change (J.P. Bruce et al. Eds.) (PDF). This version: Printed by Cambridge University Press, Cambridge, UK, and New York, NY, US. Web version: IPCC website. doi:10.2277/0521568544. ISBN 978-0-521-56854-8. ^ Article "Adaptation. If you can't stand the heat", The Economist, special report on "Climate change", 28 November 2015, page 10-12. ^ World Bank (2010). World Development Report 2010: Development and Climate Change. The International Bank for Reconstruction and Development / The World Bank, 1818 H Street NW, Washington DC 20433. doi:10.1596/978-0-8213-7987-5. ISBN 978-0-8213-7987-5. Archived from the original on 2010-04-10. Retrieved 2010-04-06. ^ PBL Netherlands Environment Agency (15 June 2012), "Figure 6.14, in: Chapter 6: The energy and climate challenge" (PDF), in van Vuuren, D.; M. Kok, Roads from Rio+20, ISBN 978-90-78645-98-6 , p. 177, Report no: 500062001. Report website. ^ Rijsberman, F.J.; R.J. Stewart, eds. (1990), Targets and Indicators of Climate Change, Stockholm, Sweden: Stockholm Environment Institute, ISBN 978-91-88116-21-5 . Summary available from the Climate Emergency Institute. ^ UNFCCC (15 March 2011), FCCC/CP/2010/7/Add.1: Report of the Conference of the Parties on its sixteenth session, held in Cancun from 29 November to 10 December 2010. Addendum. Part two: Action taken by the Conference of the Parties at its sixteenth session (PDF), Geneva, Switzerland: UN Office [permanent dead link]. Available as a PDF in English, Spanish, French, Arabic, and Russian. ^ "EU climate change target "unfeasible"". EurActiv.com. 2006-02-01. Retrieved 2007-02-21. ^ Adam, David (14 April 2009). "World will not meet 2C warming target, climate change experts agree". London: Guardian News and Media Limited. Retrieved 2009-04-14. ^ Anderson, K. & Bows, A., 2011. Beyond 'dangerous' climate change: emission scenarios for a new world. Philos. Trans. Royal Society A. ^ *The Radical Emissions Reduction Conference Archived 2017-01-19 at the Wayback Machine, 2013. Held at the Royal Society, Carlton House Terrace, London. 10–11 Dec. The Guardian, 2013. 'Every little helps' is a dangerous mantra for climate change. By Adam Corner, 13 Dec.
New Statesman, 2013. How science is telling us all to revolt. By Naomi Klein, 29 Oct.
Anderson, K. & Bows, A., 2011. Beyond 'dangerous' climate change: emission scenarios for a new world. Philos. Trans. Royal Society A.
Anderson K. (2011, July). Climate Change: Going beyond dangerous – Brutal numbers, tenuous hope, or cognitive dissonance? Video of presentation made to UK Dept. for Internal Development. ^ "Report on the structured expert dialogue on the 2013–2015 review" (PDF). UNFCCC, Subsidiary Body for Scientific and Technological Advice & Subsidiary Body for Implementation. 2015-04-04. Retrieved 2016-06-21. ^ "1.5°C temperature limit – key facts". Climate Analytics. Retrieved 2016-06-21. ^ a b c d e Gupta, S.; et al. (2007). "13.2.1.2 Taxes and charges". In B. Metz; et al. Policies, instruments, and co-operative arrangements. Climate Change 2007: Mitigation. Contribution of Working Group III to the Fourth Assessment Report of the Intergovernmental Panel on Climate Change. Print version: Cambridge University Press, Cambridge, UK, and New York, NY. This version: IPCC website. Archived from the original on 2010-10-29. Retrieved 2010-03-18. ^ Jacobson, M.Z. (2009). "Review of solutions to global warming, air pollution, and energy security" (PDF). Energy and Environmental Science. 2 (2): 148–73. CiteSeerX 10.1.1.180.4676. doi:10.1039/b809990c. Archived from the original (PDF) on 2010-04-24. ^ Jacobson, M.Z. ; Delucchi, M.A. (2009). "A Plan to Power 100 Percent of the Planet with Renewables" (originally published as "A Path to Sustainable Energy by 2030")". Scientific American. 301 (5): 58–65. Bibcode:2009SciAm.301e..58J. doi:10.1038/scientificamerican1109-58. PMID 19873905. ^ Farah, Paolo Davide (2015). "Sustainable Energy Investments and National Security: Arbitration and Negotiation Issues". Journal of World Energy Law and Business. 8 (6). SSRN 2695579. ^ "Success of Northeast Cap-and-Trade System Shows Market-Based Climate Policy Is Well Within Reach". ^ Elinor Ostrom (October 2009). "A Polycentric Approach for Coping with Climate Change" (PDF). Policy Research Working Paper Series. World Bank. Archived from the original (PDF) on 2013-11-01. ^ Tokimatsu, Koji; Wachtmeister, Henrik; McLellan, Benjamin; Davidsson, Simon; Murakami, Shinsuke; Höök, Mikael; Yasuoka, Rieko; Nishio, Masahiro (December 2017). "Energy modeling approach to the global energy-mineral nexus: A first look at metal requirements and the 2 °C target". Applied Energy. 207: 494–509. doi:10.1016/j.apenergy.2017.05.151. ^ "Industrial Technologies Program: BestPractices". Eere.energy.gov. Retrieved 2010-08-26. ^ "Clinton Hails Global Warming Pact". All Politics. CNN. 1997-12-11. Retrieved 2006-11-05. ^ Barringer, Felicity (2012-10-13). "In California, a Grand Experiment to Rein in Climate Change". The New York Times. ^ Kahn, Brian (April 13, 2019). "Minnesota Introduces Bold New Climate Change Bill Crafted by Teens". Gizmodo. Retrieved 15 April 2019. ^ Andrew Biggin (16 August 2007). "Scientific bodies must take own action on emissions". Nature. 448 (7155): 749. Bibcode:2007Natur.448..749B. doi:10.1038/448749a. PMID 17700677. ^ Anderson, K; Bows, A (2008). "Reframing the climate change challenge in light of post-2000 emission trends". Philosophical Transactions of the Royal Society A: Mathematical, Physical and Engineering Sciences. 366 (1882): 3863–82. Bibcode:2008RSPTA.366.3863A. doi:10.1098/rsta.2008.0138. PMID 18757271. ^ "Green Electric? GE unveils eco-strategy". MSNBC. ^ "Aviation groups set targets to limit their environmental impact". FT.com. ^ "5 Mutual Funds for Socially Responsible Investors". Kiplinger. ^ "Investing to Curb Climate Change" (PDF). USSIF. p. 2. ^ "Environmental Integrity Project, Sierra Club Announce Plans to Sue EPA Unless It Revises Nitrogen Oxide Emissions Standard, Curbs Nitrous Oxide Pollution Linked to Global Warming – NewsOn6.com – Tulsa, OK – News, Weather, Video and Sports – KOTV.com -". Archived from the original on 2016-01-11. Retrieved 2013-02-19. ^ Edward Lorenz (1982): "Climate is what you expect, weather is what you get"
^ "Climate change 'ruining' Everest". Heatisonline.org. 2004-11-17. Retrieved 2010-08-26. ^ Hague, Arthur Neslen The (24 June 2015). "Dutch government ordered to cut carbon emissions in landmark ruling". The Guardian. ^ "Klimaat en Energie – Thema's – Urgenda – Samen Sneller Duurzaam". ^ "Over ons – Klimaatzaak". ^ Press release (29 January 2004). Archived press release: Exxonmobil's contribution to global warming revealed. Friends of the Earth Trust. Retrieved May 25, 2015. ^ "New York is investigating Exxon Mobil for allegedly misleading the public about climate change". The Washington Post. November 5, 2015. Retrieved December 29, 2015. ^ "Major milestone: 1000+ divestment commitments". 350.org. Retrieved 17 December 2018. ^ Josh Gabbatiss, Josh (15 December 2018). "Teenage activist inspires school strikes to protest climate change after telling leaders they are 'not mature enough'". The Independent. Retrieved 17 December 2018. ^ Conley, Julia. "I'm Sure Dinosaurs Thought They Had Time, Too': Over 12,000 Students Strike in Brussels Demanding Bold Climate Action". Common Dreams. Retrieved 20 January 2019. ^ "Extinction Rebellion: Climate protesters block roads". BBC. 16 April 2019. Retrieved 16 April 2019. Alcamo, J.; et al. (2013), The Emissions Gap Report 2013, Nairobi, Kenya: United Nations Environment Programme (UNEP), Archived from the original on 2015-03-13 CS1 maint: BOT: original-url status unknown (link) Archived. Open access: Hansen, J.; et al. (2013), "Assessing "Dangerous Climate Change": Required Reduction of Carbon Emissions to Protect Young People, Future Generations and Nature", PLoS ONE, 8 (12): e81648, Bibcode:2013PLoSO...881648H, doi:10.1371/journal.pone.0081648, PMC 3849278, PMID 24312568 . Archived 14 August 2014. Ipcc tar wg3 (2001), Metz, B.; Davidson, O.; Swart, R.; Pan, J., eds., Climate Change 2001: Mitigation, Contribution of Working Group III to the Third Assessment Report of the Intergovernmental Panel on Climate Change, Cambridge University Press, ISBN 978-0-521-80769-2, archived from the original on 2017-02-27 (pb: 0-521-01502-2). Ipcc ar4 wg1 (2007), Solomon, S.; Qin, D.; Manning, M.; Chen, Z.; Marquis, M.; Averyt, K.B. ; Tignor, M.; Miller, H.L., eds., Climate Change 2007: The Physical Science Basis, Contribution of Working Group I to the Fourth Assessment Report of the Intergovernmental Panel on Climate Change, Cambridge University Press, ISBN 978-0-521-88009-1 (pb: 978-0-521-70596-7). Ipcc ar4 wg2 (2007), Parry, M.L. ; Canziani, O.F. ; Palutikof, J.P.; van der Linden, P.J. ; Hanson, C.E., eds., Climate Change 2007: Impacts, Adaptation and Vulnerability, Contribution of Working Group II to the Fourth Assessment Report of the Intergovernmental Panel on Climate Change, Cambridge University Press, ISBN 978-0-521-88010-7 (pb: 978-0-521-70597-4). Ipcc ar4 wg3 (2007), Metz, B.; Davidson, O.R. ; Bosch, P.R. ; Dave, R.; Meyer, L.A., eds., Climate Change 2007: Mitigation of Climate Change, Contribution of Working Group III (WG3) to the Fourth Assessment Report of the Intergovernmental Panel on Climate Change (IPCC), Cambridge University Press, ISBN 978-0-521-88011-4 (pb: 978-0-521-70598-1). Ipcc ar4 syr (2007), Core Writing Team; Pachauri, R.K; Reisinger, A., eds., Climate Change 2007: Synthesis Report, Contribution of Working Groups I, II and III to the Fourth Assessment Report of the Intergovernmental Panel on Climate Change, Geneva, Switzerland: IPCC, ISBN 978-92-9169-122-7 . Nordhaus, W.D. (14 June 2010), "Economic aspects of global warming in a post-Copenhagen environment", PNAS, 107 (26): 11721–26, Bibcode:2010PNAS..10711721N, doi:10.1073/pnas.1005985107, PMC 2900661, PMID 20547856 . Paper on Professor Nordhaus's website (archived 23 August 2014). UK Royal Society (September 2009), Geoengineering the climate: science, governance and uncertainty (PDF), London: UK Royal Society, ISBN 978-0-85403-773-5 , RS Policy document 10/09. Report website. van Vuuren, D.P. ; et al. (7 December 2009), Meeting the 2 degree target. From climate objective to emission reduction measures. PBL publication number 500114012 (PDF), Netherlands Environmental Assessment Agency (Planbureau voor de Leefomgeving (PBL)), Archived from the original on 2013-11-02 CS1 maint: BOT: original-url status unknown (link). Archived. Report website (archived 21 August 2014). Why Black Carbon and Ozone Also Matter, in September/October 2009 Foreign Affairs with Veerabhadran Ramanathan and Jessica Seddon Wallack. The Climate Threat We Can Beat, in May/June 2012 Foreign Affairs with David G. Victor, Charles F. Kennel, Veerabhadran Ramanathan. Community strategy to reduce CO2 from light vehicles. Rivington M, Matthews KB, Buchan K and Miller D (2005) "An integrated assessment approach to investigate options for mitigation and adaptation to climate change at the farm-scale", NJF Seminar 380, Odense, Denmark, 2005. Jacobson, M.Z. ; Delucchi, M.A. (2009). "A Plan to Power 100 Percent of the Planet with Renewables" (originally published as "A Path to Sustainable Energy by 2030")". Scientific American. 301 (5): 58–65. Bibcode:2009SciAm.301e..58J. doi:10.1038/scientificamerican1109-58. PMID 19873905. This page was last edited on 16 April 2019, at 12:53 (UTC).